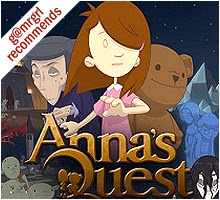 In each area, Nancy has to find the important objects, and pair relevant objects to achieve her goals. Objects that can be interacted with sparkle when the cursor is over them. To pair two objects they have to be clicked one after the other. Nancy asks questions when an object is clicked that hint at what its partner might be. Objects may be paired into one, and then the new object may need a partner object, and so on. Objects that are no longer needed disappear from the screen. There are action buttons at the bottom of the screen: Press, Pull, Turn, Scratch, Lift, Shake, etc. Some objects in the game, such as doors and drawers, need to be ‘used’ via these buttons. Nancy usually specifies the verb / action to be used in her commentary. 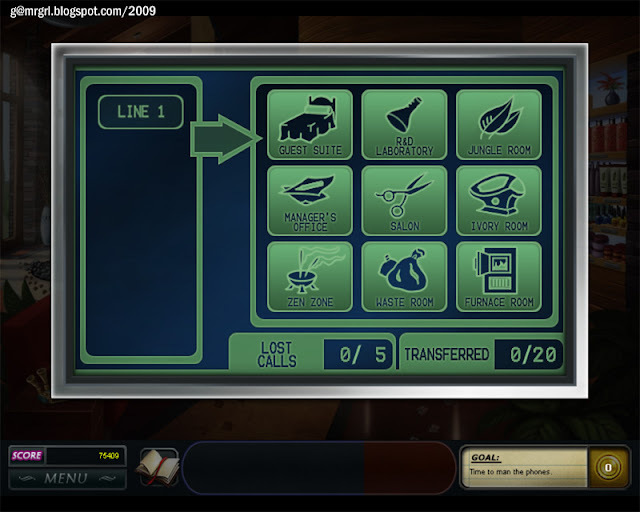 The bottom panel also has the inventory – which stores useful objects throughout the game. Objects that can be added to the inventory sparkle with a ‘briefcase’ icon. Objects on the screen can be paired with objects from the inventory. Objects which can be viewed from close-up sparkle with an ‘eye’ icon. Nancy’s immediate overall goal is also listed in the bottom panel. Clicking on the goal gives more details about it. 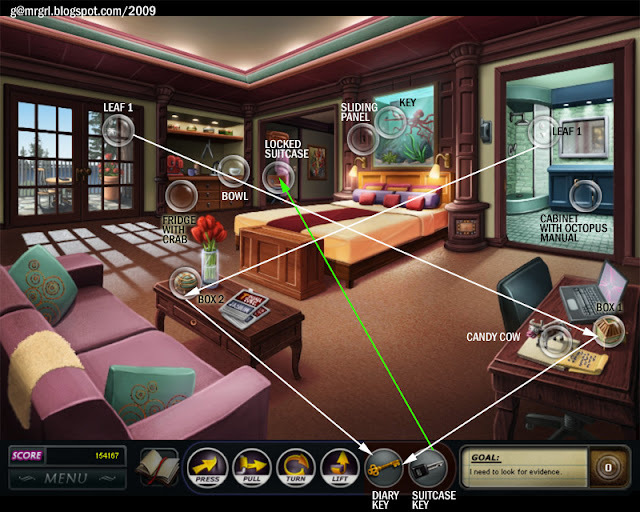 Beside the goal is a number indicating the remaining hidden objects. This number flashes when objects are added to the search list. 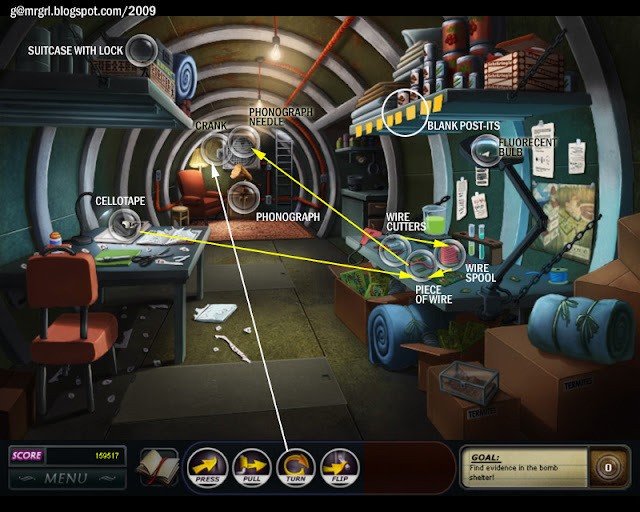 Clicking this number also reveals the location of items, using gathered hints. Nancy earns hints as she completes chapters. Once a goal is completed, it is stamped 'DONE’ and a new goal is added. The game involves a points system, which leads to Nancy’s Detective Ranking – if she makes the top level, Ultimate Private Eye, then the player can see the ‘Special Credits’. 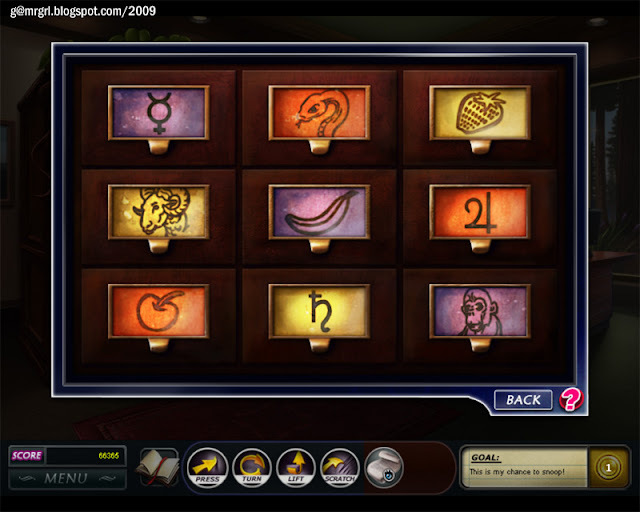 During conversations, Nancy can choose her options – getting the answer right on the first try has 100 point bonus. A conversation can be paused by clicking the ‘Menu’ button at the bottom right of the screen. Some conversations can be ‘skipped’ as well. Conversations vary depending on the way the game is played, and may not match mine. Cassidy gives Nancy a map of the resort that she uses to move around. Nancy’s current location is shown in blue. She can click on another location to go there. The arcade puzzles have detailed tutorials and also a Help button. A number of the puzzles are randomly generated. A journal in the bottom panel lists the chapters and objectives. There are six different possible endings to the game. For more detailed instructions and hints on gameplay, get the official Strategy Guide. The flowers go into the vase on the top shelf to the right of the screen. The papers go into the yellow folder on the reception table. The folder has to be stored somewhere. Click the lowest drawer of the cabinet to the right of the screen. It has to be pulled open – click the drawer and click the Pull button at the bottom of the screen. Put the folder in the drawer. 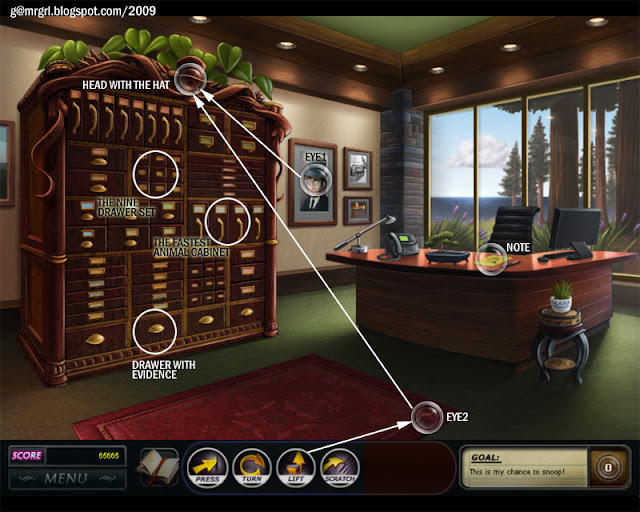 Click the letter opener on the table – it sparkles with a briefcase icon which means it’s added to the inventory at the bottom of the screen, to be used later. Click the envelope beside the fishbowl on the table next to the red sofa. Click the letter opener in the inventory. 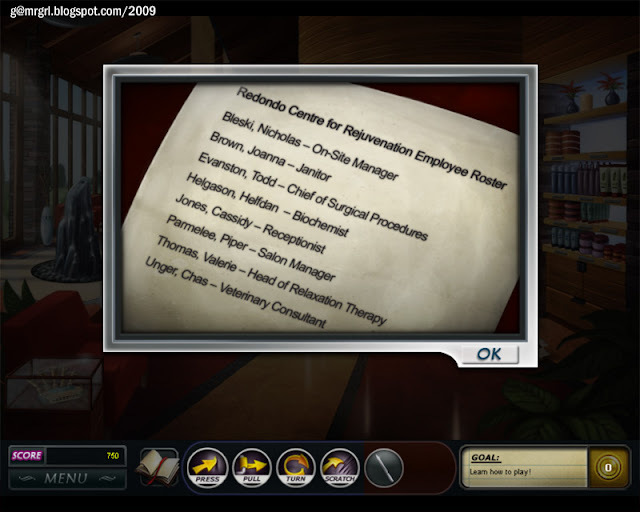 It contains the list of employees at the Centre. New Goal: Finish Cassidy’s task list and snoop a little. Click the task list next to the towels on the reception desk. Click here for the locations of ALL items to finish the tasks. Click the empty space on the second shelf from top. It needs shampoo. Click Box 1 – the bigger box on the floor near the reception desk. Place the shampoo on the shelf. Click on the empty space on the second shelf from bottom. It needs nail polish. Click on Box 2 – the smaller box next to Box 1. It has nail polish bottles. Place the nail polish on the shelf. Click the white lights hanging above the reception desk. They are dirty. Click the pink feather duster in front of the reception desk. 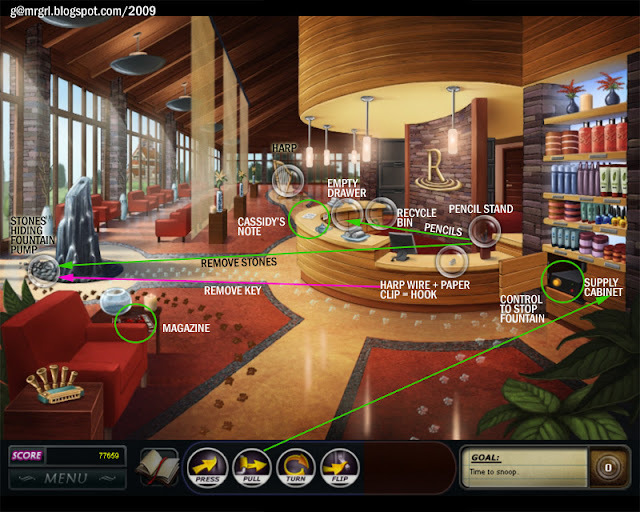 Click the harmonica case in front of the red sofa at bottom left. Click the blue glass cleaner bottle on the reception desk. Click the harmonica for a close-up. The case has to be lifted. Click the case and the lift button in the bottom panel. The top of the harmonica is screwed tight – Nancy needs a screwdriver. Click the top, extreme-right drawer of the reception table – above the green recycle sign. It needs a good tug: click the pull button on the bottom panel. Click the open drawer – a screwdriver! Click the note: it’s a letter from a Hippocrates Bell, who was born in 1885 and presumed by his doctor parents to be a future doctor, hence his name. But that didn’t turn out as planned – he was more an inventor / architect. Click the note to read the second page – it talks about the projects in the pillars. Talk to Nick Bleski, the high-strung on-site Manager. The answer to Nick’s question (why Nancy was there) is ‘to investigate the bombings’. The answer to Nick’s question (you just got here in time) is ‘to go out there and fold the towels’. Talk to Cassidy. Click the map of the resort. 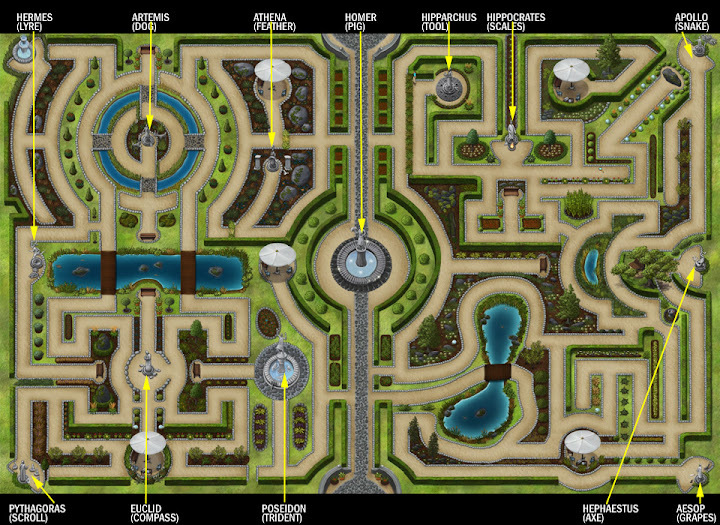 Below it is a map of the Garden Maze. Take the note from Cassidy: ‘This could be a STICKY situation’. Solution: This is a swap game. Click on two pieces to swap them so they form complete letters. Letters can be swapped vertically or horizontally or diagonally, as the tutorial shows. A tile may be swapped only with another right next to it in ANY direction, and needs to form a COMPLETE LETTER. Each letter – in this case S, E, V, I and N, have to be found a certain number of times till their gauges fill up. Clicking ‘Hint’ (the bulb on the left of the screen) will light one tile that can be matched with another. If there are no matches possible, use the ‘Scramble’ button at top left to reset the board. Keep matching letters till all gauges are filled. This puzzle has multiple and variable solutions. 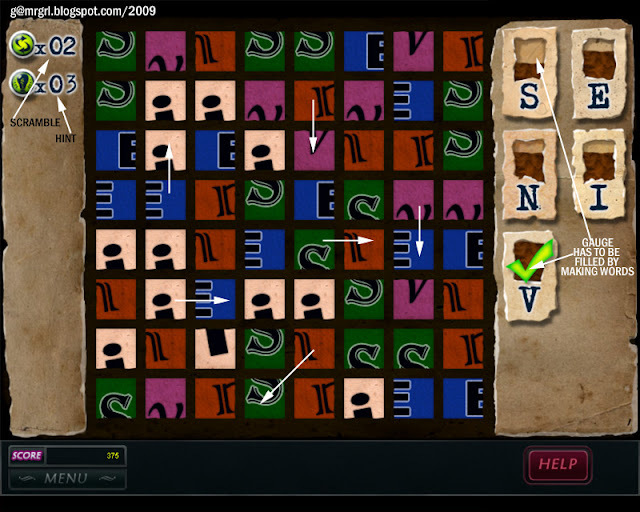 Click here to view the puzzle screen with sample movements. Solution: Unscramble the word by clicking on two alphabets to swap them. Hint: ‘I hang out in the tropics’. Unscramble ‘SVNIE’ to get ‘VINES’. 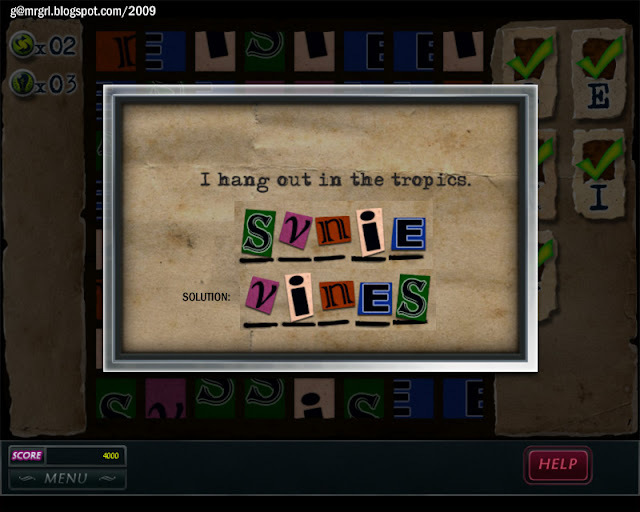 Since the note mentions ‘Tropics’ and ‘Vines’, click on the Jungle Room in the map, on the third floor of the resort. The answer to Mrs. Montague’s question (who’s there?) is ‘general assistant’. New Goal: Take care of Mrs. Montague. Click here for the locations of ALL items that are part of this goal. Mrs. Montague wants Nancy to scratch her nose. Click the scratch button, then click Mrs. Montague’s head. Nancy has to fix the hot water system. Click the square panel on the side of the bathtub. Turn the knob to increase the temperature. Nancy now has to find the dying plant and revive it. The dying plant is not very obvious – it’s on the right of the red flowers at the right of the screen. Click watering can on the right of the trolley with the towels. The watering can is empty. Click the watering can and then the waterfall in the middle of the bathtub. Click the dying plant and the full watering can. Nancy has to locate the Tinsel Town Tattler and read Lydia’s column. Click the small yellow table between the two yellow deck chairs. Click the drawer to read the Tinsel Town Tattler – actress Jasmine Ivy has apparently gotten some plastic surgery done at Redondo recently. Nancy has to brew some anti-ageing tea. 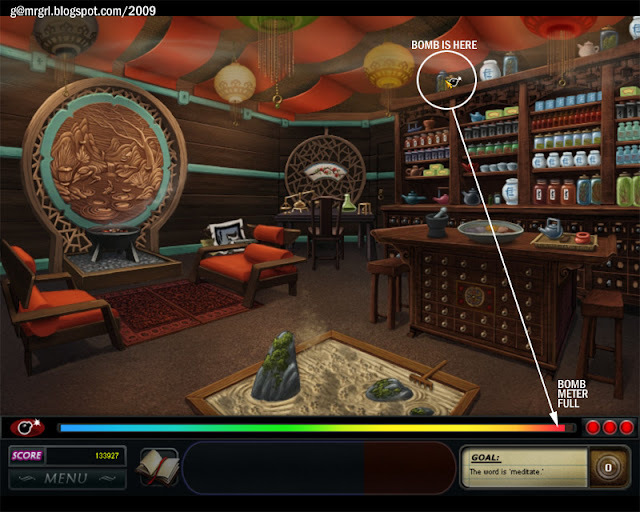 Click the white sheet on the tea trolley at the middle bottom of the screen – tea making instructions. Click the green refrigerator to the immediate right of the empty bathtub. Click the strainer, to the left of the big teapot. The tea is in the strainer. Click the strainer and the teapot. Click the teapot and the water dispenser to the left of the bathtub. Click the teapot with the brewed tea and the cup in front of the teapot. Click the cup and Mrs. Montague’s head to give her the tea. New Goal: Where is that bomb? Move the bomb detector across the screen till its meter (empty line beside the bomb icon) is full. Click on the shower head above the refrigerator to the right of the tub. Nancy finds a green box. 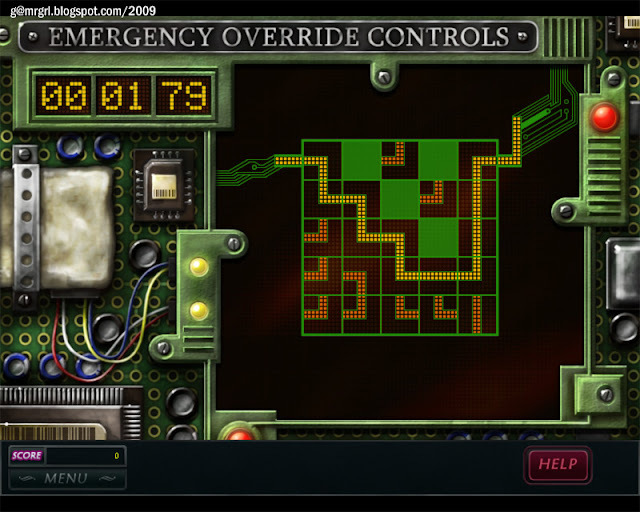 Click the knob twice to open the green box – it reveals the Emergency Override Panel. Click anywhere inside the Panel to start the override process. Solution: This is a pipe game. To override the bomb, the path from left to right has to be connected within 60 seconds. 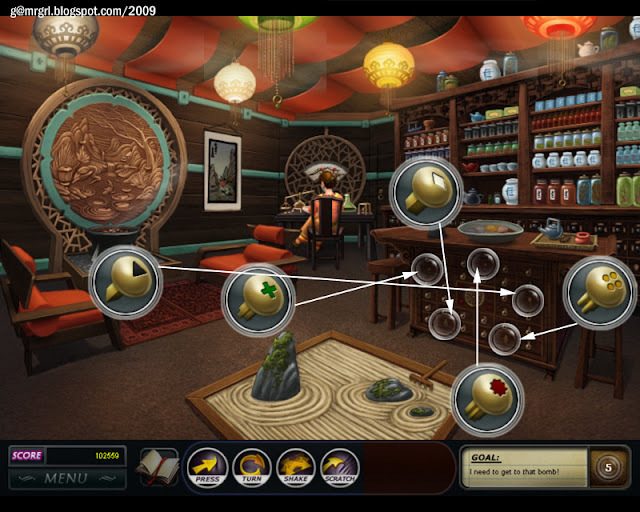 The tutorial has a practice level to learn the gameplay. Any two pieces of the grid can be swapped by clicking them one after the other. While this game isn’t difficult, the rapidly flashing milliseconds on the clock are really stressful :) This game may have multiple solutions. The answer to Nancy’s question (when Mrs. Montague says Mr. Mingles might swallow the hair) is ‘a dog’. 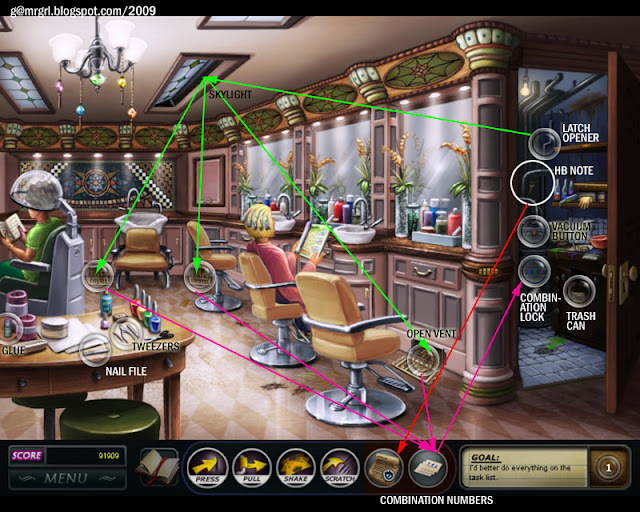 Use the map to go to the Salon. New Goal: Where is Mr. Mingles? Mr. Mingles is barking from somewhere inside the walls. 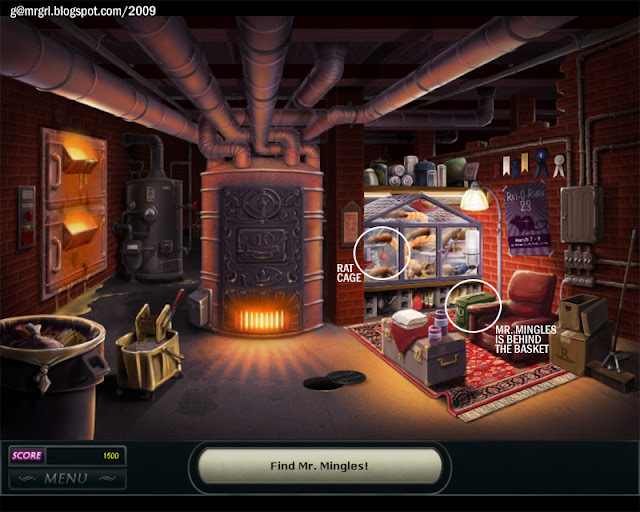 Click here for the locations of ALL items required to find Mr. Mingles. Click the pink panel on the right of the star mosaic on the back wall. 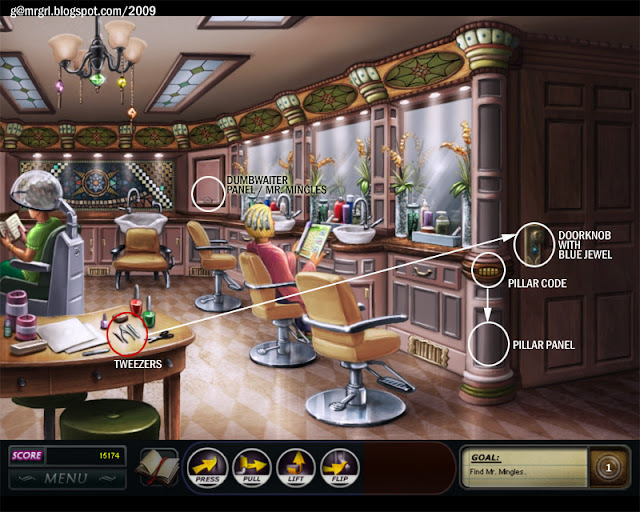 Click the design on the pillar to the left of the doorknob of the salon’s door. Solution: This is a match-two game. Click to match two related items: rope-knot, cloud-water drop, tree-leaf, bird-feather and constellation-star. A panel opens. Click to add the note to the inventory. Apparently the pink panel is a dumbwaiter to the dining room. Click the doorknob. There’s something stuck in it. Pick the tweezers from beside the nail polish on the table at bottom left. A blue jewel is added to the inventory. The doorknob is free. Pull the doorknob. It leads to the store. Click here for the locations of ALL items required to light the panels. Click the drain in the store. The cover needs to be lifted. Lift the drain cover. Click the key. What does it open? 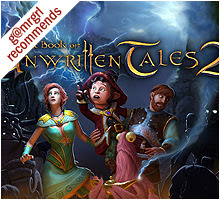 Click the store shelf towards the top right of the screen. Solution: This is a weights game. Bottles have to be moved from bottom shelf to top shelf till the top shelf has 15 oz as per HB’s note. A bit of math is added by keeping the bottles partially full. All bottles EXCEPT the orange Ocean Fresh (extreme right) and the tall blue 9 oz (third from right) have to be moved up to the top shelf. A mosaic window lining the ceiling gets lit. Click on the pink cabinet immediately below the mosaic. It needs a key. Click the key in the drain and then the cabinet. The cabinet opens, revealing a lever. Flip the lever. Look at the chandelier hanging from the ceiling – it has 5 strings but 4 jewels: purple, green, yellow and orange. So the blue jewel is missing! Click the blue jewel in the inventory and the empty chandelier string. Click the star mosaic on the back wall of the salon. It’s missing three pieces (tiles). Click the pillar immediately to the right of the dumbwaiter panel. A shelf is exposed, containing a tile. Click the tile and the top left slot of the star mosaic. 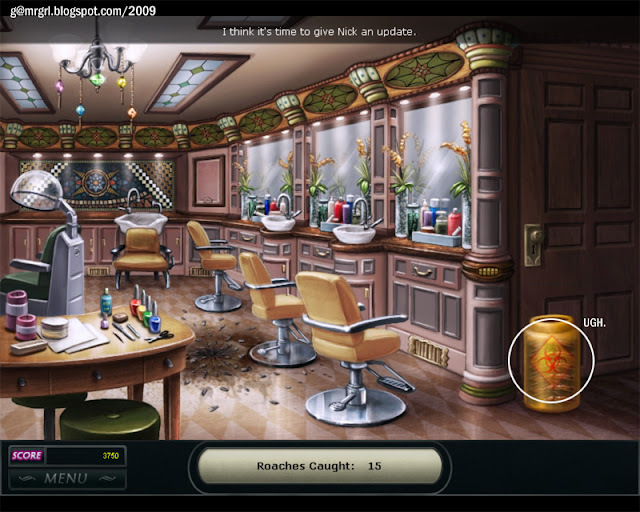 Click the pillar in front of the head of the blond woman, to the right of the dumbwaiter. Click the tile and the middle slot of the star mosaic. Click the pillar behind the basin in front of the blond woman. Click the tile and the bottom right slot of the star mosaic. The dumbwaiter opens – there’s Mr. Mingle! 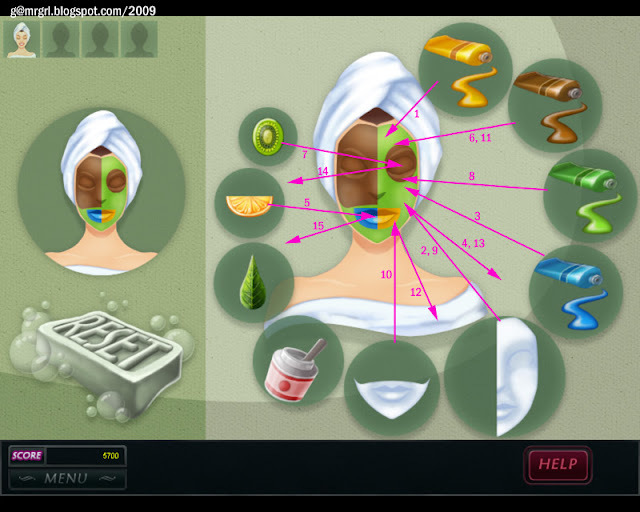 The answer to Mrs. Montague’s comment (about the green goo) is ‘shower head’. The answer to Mrs. Montague’s comment (about Helfdan) is ‘biochemist’. New Goal: Find Helfdan, the biochemist. Click the laboratory, which appears on the map, below the Ivory Room. Dr. Helfdan wants Nancy to make some solutions. Solution: This is a match-three game. As shown in the tutorial, the goal is to form the types of molecules shown on the right of the screen. The structure of the molecule appears in bold red circles on the left side. Each molecule has three smaller parts – slices – in different colours. The molecules have to be clicked to rotate so that three same coloured slices are placed next to each other within a red circle, making a complete molecule, which is then added to the outline on the right. Right-clicking rotates the molecules clockwise, left-clicking anti-clockwise. 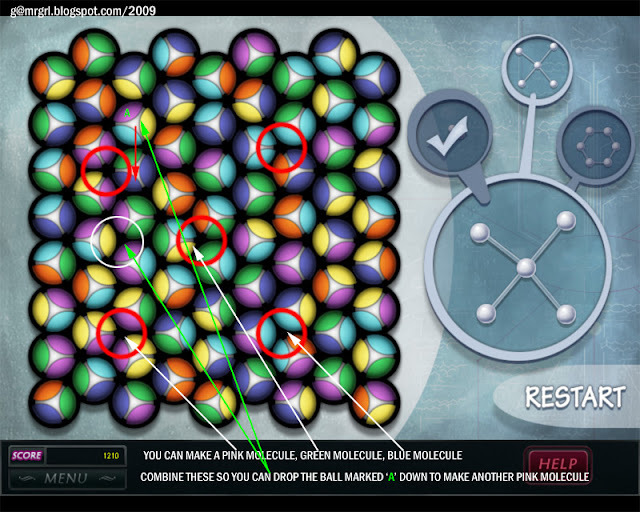 If the molecules in the red circles have no common colours, build molecules below the circles to ‘drop’ more molecules from the top of the screen. 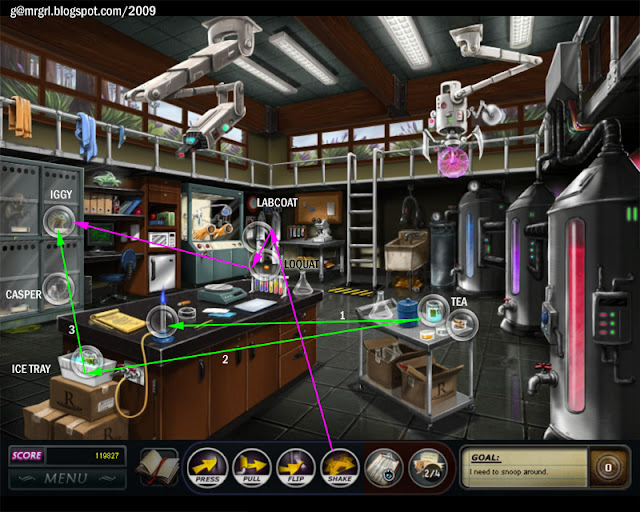 This game has multiple and variable solutions. The answer to Dr. Helfdan’s question (is it your hair) is ‘explode’. New Goal: Decode the note. Take the note that Cassidy places on this desk. Solution: This is another note game, to be played as usual. Only, we have some blank tiles this time around, which cannot make matches themselves but can be swapped with tiles that do make matches. And Nancy can now get power-ups – Hints and Scrambles – by matching tiles containing those icons. As usual, the game has multiple and variable solutions. Of course, not using any power-ups gives a bonus. Solution: Unscramble the word. 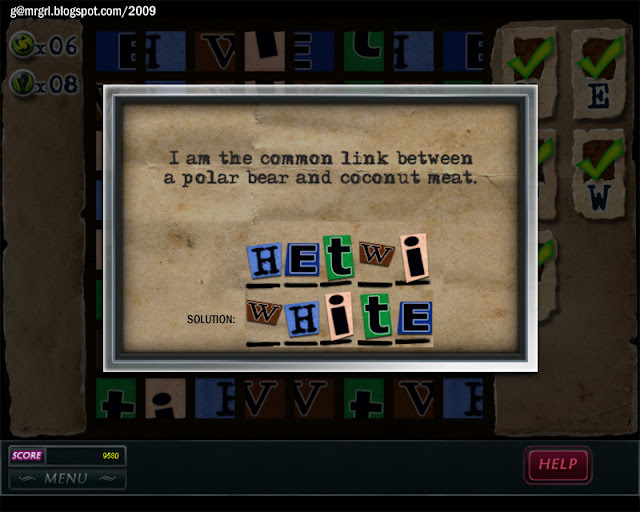 Hint: ‘I’m the common link between a polar bear and coconut meat’. Unscramble ‘HETWI’ to get ‘WHITE’. So which part of the resort is white? The Ivory Room, of course! New Goal: Complete the facials. Solution: The customer has to look like the image on the left. First click on the tube the colour of the eyes and/or nose and/or mouth. Then put the kiwi slices on the eyes and/or the orange on the mouth and/or the leaf on the nose to cover them. Nancy can also use the white masks to cover parts of the face. The mask goes OVER the fruits / leaf. Then apply the tube the colour of the face. Remove the fruit slices and leaf. A soap bar allows Nancy to reset if she makes a mistake. Facial 1 is a tutorial demo. These puzzles have multiple solutions. Click for facial 2 / facial 3 / facial 4 / facial 5. New Goal: Find the bomb. The bomb is in the sensory deprivation unit / pod, the blue contraption. New Goal: Get the pod open. 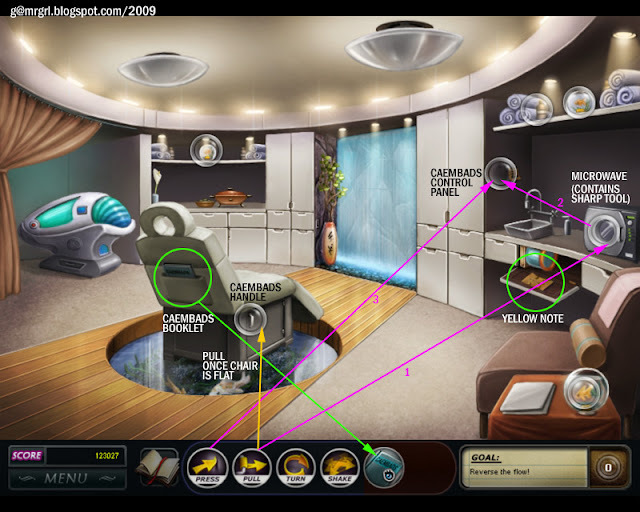 Click here for the locations of ALL items required to open the pod. Click on the blue square panel on the pod. Click the yellow valve just below the blue instruction panel. Turn it. The water drains. Click the top white cabinet on the left of the potted plant / water screen. Pull it open. The hose is inside. Click the hose, then the outlet of the sink on the right side counter. Click the hose, then the inlet of the pod, towards its front. Click the faucet of the sink. Turn it. The pod is refilled. 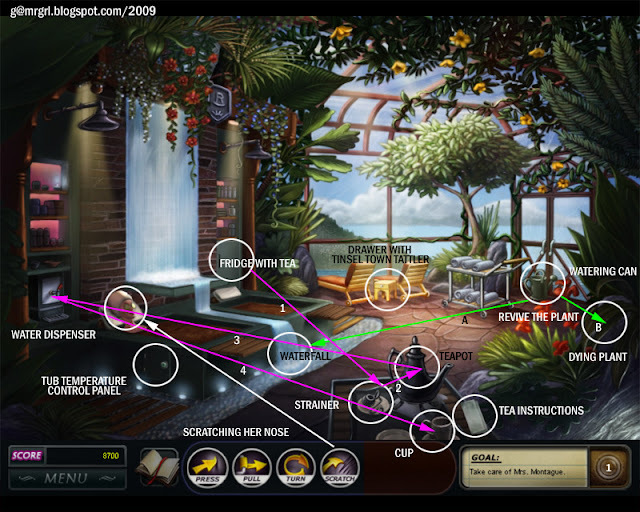 Click the button just to the left of the potted plant to reveal the aquarium control panel. Click the big bag of pool salt, the white packet. Click the salt reservoir, the tray at the foot of the pod. The salt is refilled. Click the pink UV bulb, in the aquarium panel above the bag of salt. Turn it. The bulb is added to the inventory. Click the bulb, then the UV lamp slot at the rear of the pod. Solution: This time with a twist – some green panels that cannot be moved! And only 50 seconds!!! The answer to Nancy’s comment (about the note) is ‘threatening’. New Goal: Where could the hissing be? 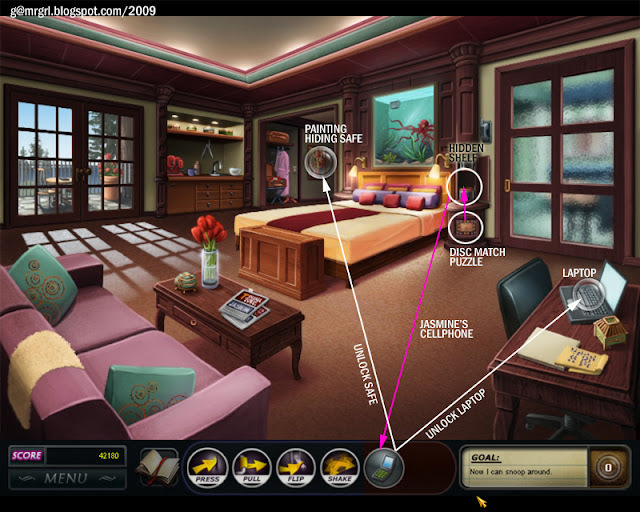 Click on the Guest Suite on the map, now labelled as Jasmine’s Room. New Goal: Find what is hissing. Click here for the locations of ALL items required to find what is hissing. 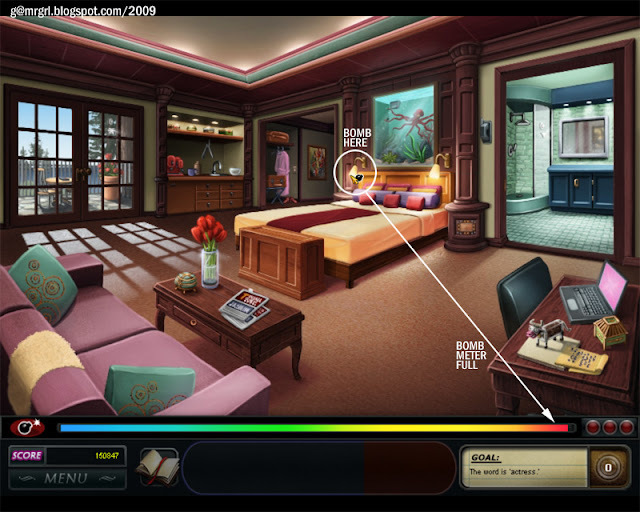 Click the square yellow panel on the pillar to the right of the bed, beside the large door. 1 horn of a unicorn, 5 points of a star, 7 wonders of the world, 2 faces of Gemini, 8 arms of an octopus, 10 years of a decade, 4 leaves of a clover and 0 degrees i.e. freezing temperature. A shelf opens above the panel. Click the shelf. Jasmine’s cellphone was stuck in the valve, causing the hiss. Click the cellphone. It is added to the inventory. Click the painting in the hallway, on the right of the pink bathrobe. Pull the painting to reveal a safe. Nancy needs the combination to the safe. Click the laptop on the table on the right of the room. Click the cellphone in the inventory. It has both the computer password and safe combination. Click the cellphone and the laptop. There’s an email from Jasmine’s Mom – Jasmine is Eda Brook’s sister (though Eda is not known yet). Click the cellphone and the safe. Click the yellow envelope inside the safe. Jasmine has been collecting the bomber’s notes. The answer to Nick’s question (are you getting anywhere) is ‘has been getting threats’. The answer to Nick’s question (what about Mrs. Montague) is ‘keep her from getting covered with goo’. The answer to Nancy’s comment (about the bomb in the jungle room) is ‘was a dud’. New Goal: Where to go next? 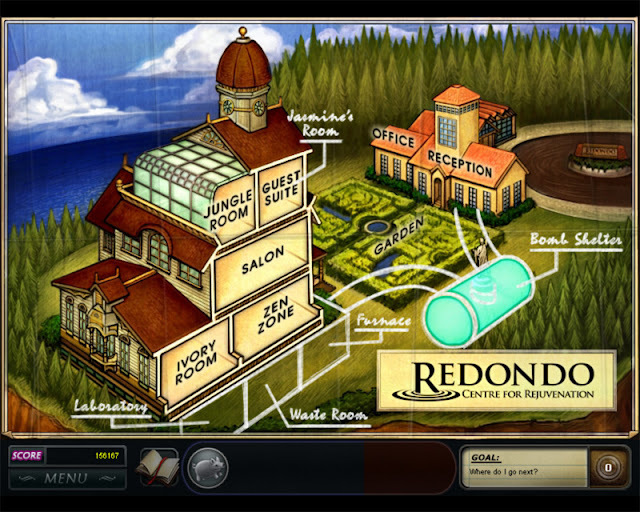 Click the laboratory, Helfdan’s workplace, on the map. New Goal: What is Helfdan hiding? Click here for the locations of ALL items required for the first part of this chapter. Click the green lunchbox on the shelf above the microwave and refrigerator in the middle of the room. It is locked with a code and has the photo of a monkey. Click the monkey in the glass cage at the left of the room. His name is Bean. The lunchbox is open. Click the lunchbox. There’s a note from Helfdan’s Mom: seems he is unhappy with the lack of respect he gets at the Centre. Click the note to read the second page: ‘The test tubes must be put in their places, then the fourth one is the key’. Click the stand with the coloured test tubes on the desk. Take the key from the third bottle from right, i.e. the green (Yellow + Blue) bottle. Click the bottom right drawer of the desk. It’s locked. Click the key – it cannot be used because it’s stuck in jelly. Click the Bunsen burner at the left corner of the desk. It’s not connected to the gas. Click the yellow hose lying on the crates beside the desk: the gas pipe. Click the Bunsen burner to connect the hose. 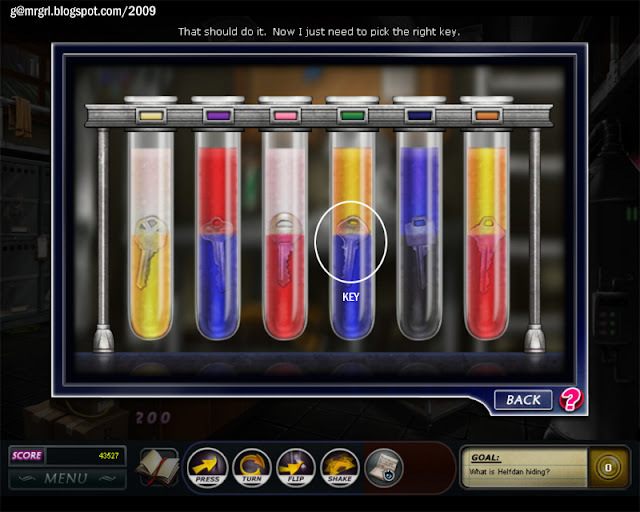 Click the test tube stand to take the test tube with the key. Click the Bunsen flame. The jelly melts and the key is free. Click the key in the inventory. Click the locked drawer. Click the note added to the inventory. Click here for the locations of ALL items required to make Compound X.
Click the conical flask on the trolley in the middle of the room. Click the faucet of the red liquid dispenser at the right of the room. The faucet is broken – it has no valve. Click the white jacket hanging at the back of the room, left of the ladder. Shake the jacket. The valve is in the pocket. Click the valve. Click the faucet of the red liquid dispenser. It’s fixed. Click the faucet. Click the conical flask. The flask has red liquid. Click the dish with grey powder in the middle of the desk, on the right of the Bunsen burner. Click the weighing scale, on the right of the powder. Click the 5 oz of powder on the weighing scale. Click the conical flask. The liquid changes colour. Click the faucet of the blue fluid dispenser. Click the cylinder with 500 ml blue fluid. Click the 1000 ml cylinder, on the right of the notepad. Click the faucet of the purple fluid dispenser. Click the cylinder with 1000 ml purple fluid. The contents are ready. Click the conical flask. Click the petri dish, near the front of the trolley with the flask. Solution: Another round of match-3 with molecules. Play the same way as before. As usual, this game as multiple solutions, hence no screenshot! New Goal: Find Mr. Mingles... again. Click the newly added Furnace Room on the map. Solution: This is a mouse-controlled rat trap. Hmm. It’s also a bonus round. Nancy has to catch as many rats as she can before time runs out and return them to the large glass cage. Click on a rat to catch it, keep the mouse pressed to keep holding the rat and drop it in the cage. Being a game of skill, I performed woefully, managing to catch only 5 or 6 rats. Now, to find Mr. Mingles. Click the green basket behind the sofa, in front of the rat cage – Mr. Mingles! And, uh... Joanna. The answer to Nancy’s question (and you are) is ‘janitor’. The answer to Nancy’s question (since you’re invisible) is ‘construction accidents’. Solution: This is another note game, to be played as usual. 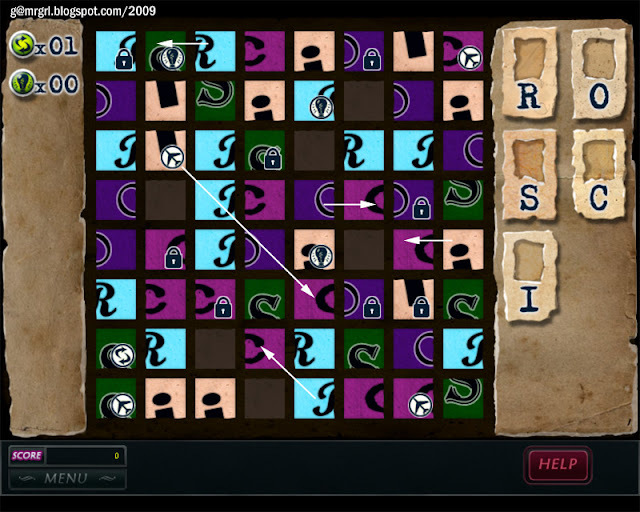 More twists this time – there are new WARP tiles, marked with a plane, which can be swapped with ANY tile, not just adjacent ones, to make a match, and the LOCKED tiles, which cannot be swapped with other tiles, but can be removed by moving other tiles around it to make a combo with it. Solution: Unscramble the word. Hint: ‘I’m a pair yet one object’. Unscramble ‘ROSCISSS’ to get ‘SCISSORS’. So which part of the resort involves scissors? The Salon, of course! Solution: Oh, man...! Another bonus round, like the rat-catcher... just eekier. Nancy has to catch as many cockroaches as she can before time runs out and return them to the yellow biohazard container. Click on a cockroach to catch it, keep the mouse pressed to keep it and drop it in the container. I did better this time, managing to catch a whopping 15! New Goal: Snoop around Nick’s room. Click here for the locations of ALL items required for this chapter. 2. Shred the documents in the locked cabinet. Look at the painting of the head on the right of the cabinet. It has an eyeball. Click the eyeball. Click the head with the hat in the top middle of the cabinet. It fits! Click the top right corner of the carpet. There’s another eyeball. Click the eyeball. Click the head with the hat again. Now both eyes are in place. Take the note set out on the head’s tongue. 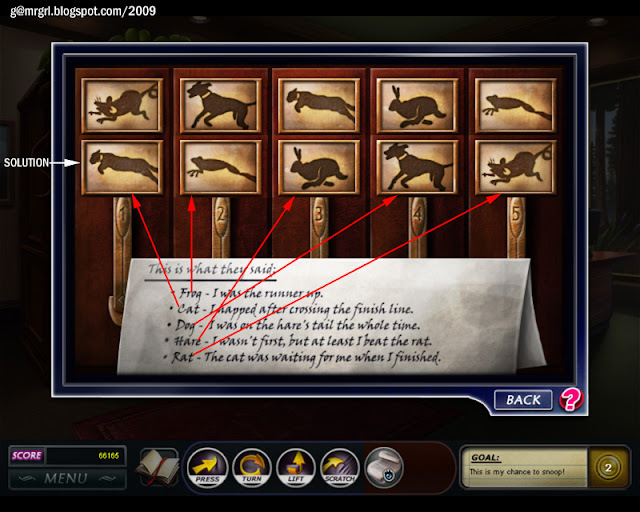 The first page of the note shows a series of 5 vertical drawers, to be opened via the Fastest Animal game. Click the note to see its second page. It shows a set of 9 square drawers, to be opened via the Rows & Columns game. Click the set of 4 vertical drawers with handles, the third shelf from the top on the right side of the large cabinet. 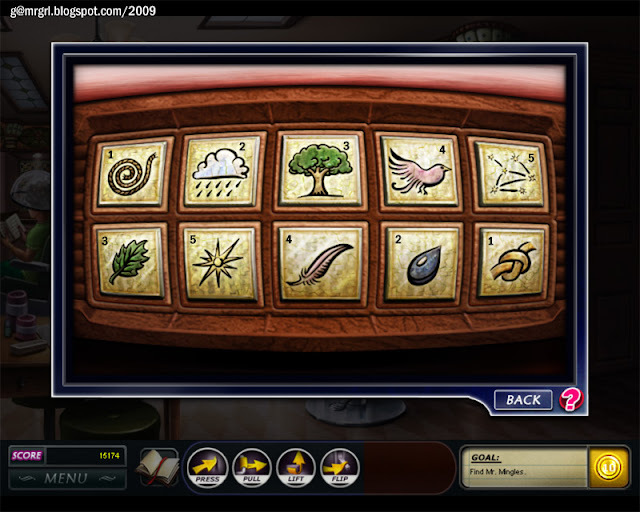 Click the set of 9 square drawers, diagonally to the top left of the fastest animal drawers. First set 1 symbol, 1 fruit and 1 animal in each row. Then check the columns. Then the colours. This game has multiple solutions. A drawer opens at the foot of the cabinet. Click the white sheet inside. Click on the Furnace Room on the map to investigate Joanna. New Goal: Find the bomb! Slide the bomb detector across the screen. The bomb is inside the furnace in the middle of the room. Nancy needs to turn off the furnace. Click here for the locations of ALL items required to turn off the furnace. Click the control box at the bottom left of the furnace. Lift the box open. It needs a crank. 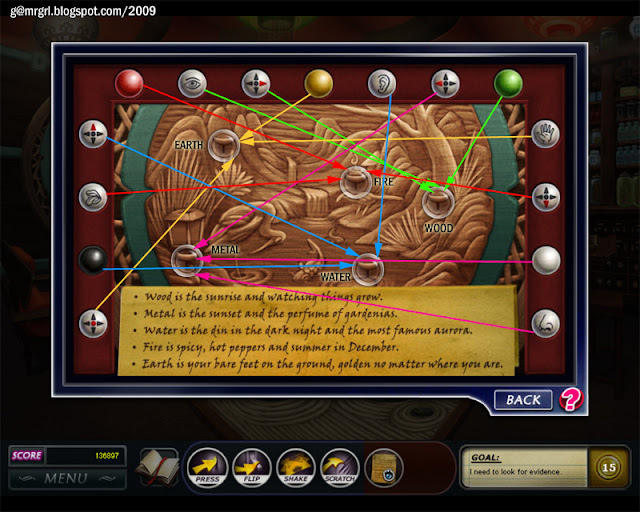 Click the crank at the top right of the screen, above the colourful ribbons. It’s too high. 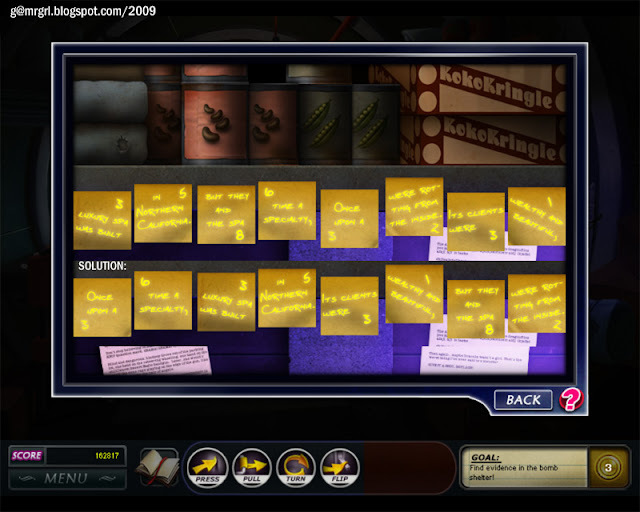 Click the long-handled broom leaning against the extreme right of the screen, beside the cartons. Click the crank when it falls on the sofa. Click the crank box. Turn the crank in the box. The furnace is off. Click the furnace door. Pull it open. Click the piece of paper to take it. Solution: Back to 60 seconds. Business as usual... and this was tricky. Took me three attempts. New Goal: What is Joanna hiding? 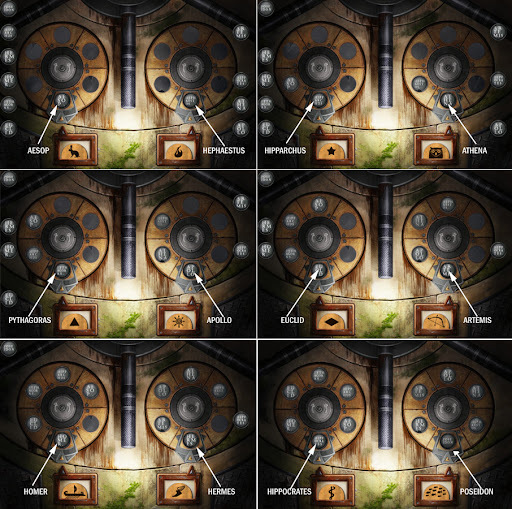 Click here for the locations of ALL items required to unlock the trunk. Click the trunk in the middle of the room: it’s locked, and needs two keys. Click the drain in the middle of the room. Lift the drain cover. Click the crucible. It holds metals to be melted at low temperatures. The crucible is added to the inventory. Click the recliner handle on the right side of the recliner. Turn the handle. It reveals a key mould. Click the red book on the shelf behind the lamp near the rat cage. There is a can of rat food behind it. Click the triangular roof of the rat cage. One of the pipes has a metal ingot inside. Click the rat food. Click the rat cage. Voila! Click the ingot on the floor. Click the crucible in the inventory. The ingot is ready to be melted. Click the crucible + ingot. Click the kiln, the open fire on the left side of the screen. The ingot is melted. Click the ingot, then the key mould near the recliner. Click the key mould with the newly-set key beside the drain. Too hot! Click a towel from the stack above the rat cage. Click the mould. The key is added to the inventory. But it’s still too hot. Click the yellow bucket of mop water in front of the kiln. Click the key. Now the key is cool enough to use. Click the key. Click the right lock of the trunk to unlock it. The left side is still locked. Click the dustbin at the extreme left of the screen. Click the broken screwdriver. Click the loose red handle protruding from the yellow mop bucket. The improvised screwdriver is added to the inventory. Click it. Click the screw with a musical sign just above the furnace door. Click the second key from the floor beside the drain. Click the left lock of the trunk. The trunk is open! Hmm, what’s here? A creepy ‘anti-shrine’ to Jasmine. Nancy wants to check on Jasmine so click on Guest Suite in the map. New Goal: Any more interesting emails? Click the laptop: Jasmine has changed her password! Nancy needs to find Jasmine’s cellphone again. Click here for the locations of ALL items required to unlock Jasmine’s laptop. Click the Tattler tabloid on the coffee table. Click the small scrap of paper on the top left of right side page. It’s a piece of Jasmine’s business card. Click Jasmine’s suitcase, beside the pink bathrobe. Click the tape dispenser. Click the torn card pieces in the inventory. Solution: This is a simple jigsaw. Drag the pieces to put them in the square. Start with the corners and work in. Even once complete, I could not exit this game without clicking ‘BACK’. Click the card in the inventory. Click the telephone on the left wall beside the bathroom door. Roll the mouse over the screen till Nancy finds where the ring is coming from. The cellphone is in the TV cabinet, the box at the foot of the bed. Nancy needs the remote to open the TV cabinet. Pull open the balcony doors to the left of the screen. Click the remote control on the patio table. It is dead. Click Jasmine’s suitcase beside the pink bathrobe. Click the extra batteries. Click the remote control. It’s alive! Press the power button. The TV is out. Click the top right corner of the TV – the cellphone! Click the cellphone in the inventory. Click the laptop. Jasmine’s agent Simone Mueller is actually excited about the threatening letters as it boosts public curiosity about Jasmine. The answer to Nancy’s comment (about Joanna’s collection) is ‘rats’. The answer to Nancy’s comment (about recent news) is ‘underwent plastic surgery’. The answer to Nancy’s question (about Eda Brooks) is ‘your sister’. New Goal: Man the phones. 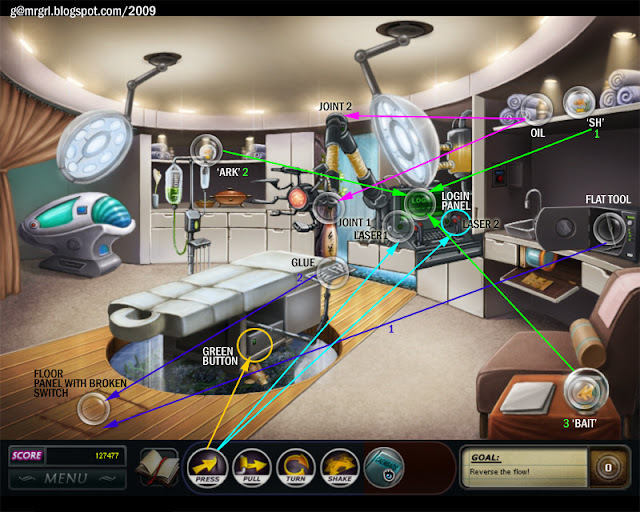 Click here for a game screenshot. Click here for the locations of ALL items required to snoop on Cassidy. Click the magazine on the side table beside the red sofa. Its bottom corner is torn, matching the piece found in the furnace room bomb. The piece may be in the recycle bin, the rightmost drawer or Cassidy’s desk, with the green sign. The bin is locked. Click Cassidy’s note on the counter of the desk. Mr. Mingles has run off with the keys. Click the left drawer below the cosmetics shelves. Pull it open. It contains the fountain controls. Click the controls. Press the yellow button. The fountain is off. Nancy needs to move the stones from the fountain. Click the pencil holder on Cassidy’s desk, on the right of the monitor. Nancy needs to keep the pencils somewhere. Click the drawer on the left of the recycle bin. It’s empty. Click the pencil holder to put the pencils in the drawer. Click the empty pencil holder scoop. Click the stones. The fountain pump is exposed. The keys are in it. Nancy needs something to pull the keys out. Click the harp at the back of the room. It has a loose wire. 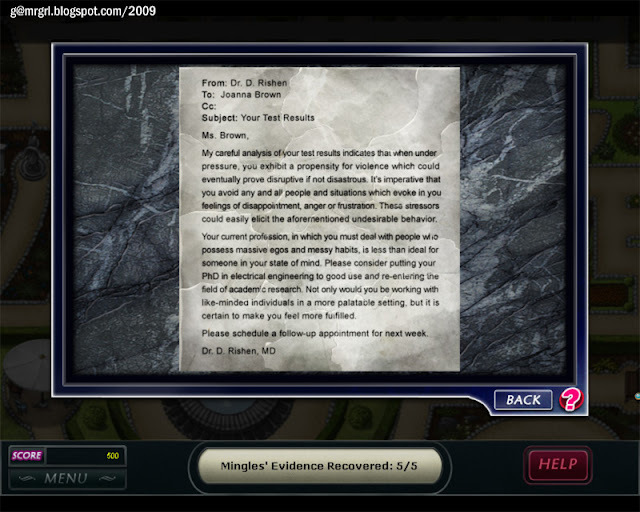 Click the paper clip on Cassidy’s desk, on the right of the monitor. Nancy now has a fish-hook. Click the fish-hook. Click the keys in the fountain pump. Gotcha! Click the keys in the inventory. Click the recycle bin. The magazine belongs to Cassidy! The answer to Nancy’s question (about the bomb) is ‘a piece of your magazine wedged in the last bomb’. The answer to Nancy’s question (on magazine subscription) is ‘practically declares war on the wealthy’. 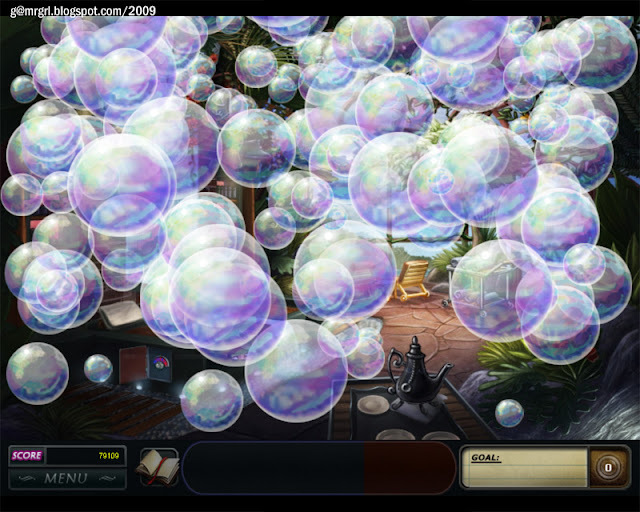 Solution: Roll the mouse over the bubbles to burst them and expose Mr. Mingles, then click on the dog to catch it. Mr. Mingles bites, so it may take a couple of attempts to catch him. The answer to Nancy’s comment (about the blue bubbles) is ‘swallowed an explosive compound’. The answer to Nancy’s comment (about Helfdan’s explosive) is ‘Compound X’. New Goal: Complete the task list. Click on the yellow note on the salon door. Solution: Another round of the facial game. This set involves a lot of planning so think first, then apply! Click for facial 1 / facial 2 / facial 3 / facial 4 / facial 5. Click here for the locations of ALL items required to fix the vacuum cleaner. Click on the salon doorknob. Pull it open. Click on the note lodged between the vacuum cleaner pipes. Nancy needs to look at the sky and the ground to find the code for the vacuum cleaner. Click the skylight in the middle of the ceiling. Click the latch opening hook hung from the vacuum pipes in the store, above where HB’s note was. The skylight opens – it is connected to the vacuum system. Three vents along the floor skirting open up. Click the vent near the first salon chair. Nancy needs to clear the hair. Click the vent. Click the trash can in the store, inside the cabinet. Take the chit with the green coloured numbers 1, 2, 4. Click the middle vent, just behind the pink woman on the right. Click the trash can. Take the chit with the blue coloured numbers 7, 9, 6. Click the left vent, at the back of the room. Click the trash can. Take the chit with the pink coloured numbers 5, 3, 8. Click the chits in the inventory with the three button combination lock on the vacuum cleaner. 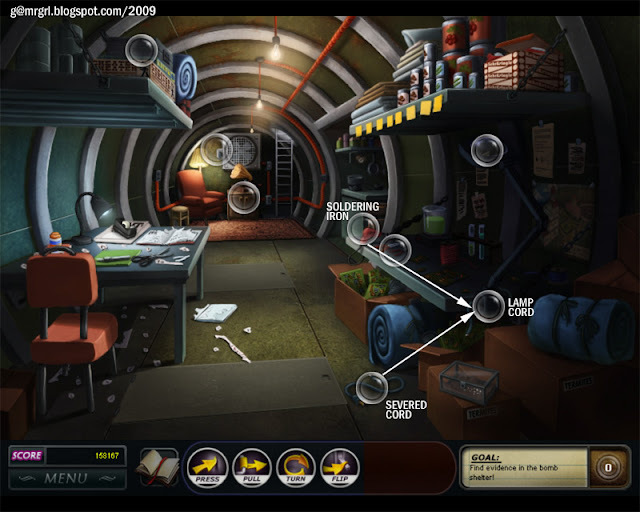 Click here for the game screenshot. The vacuum cleaner is open. 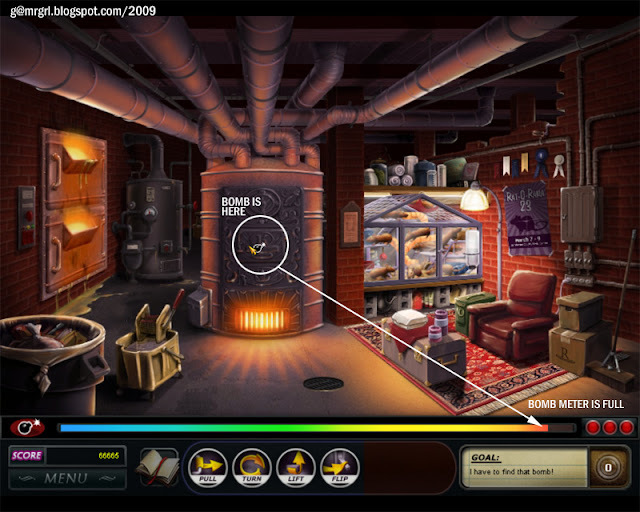 Click the yellow pipes of the cleaner. A screw is stuck in the pipes. 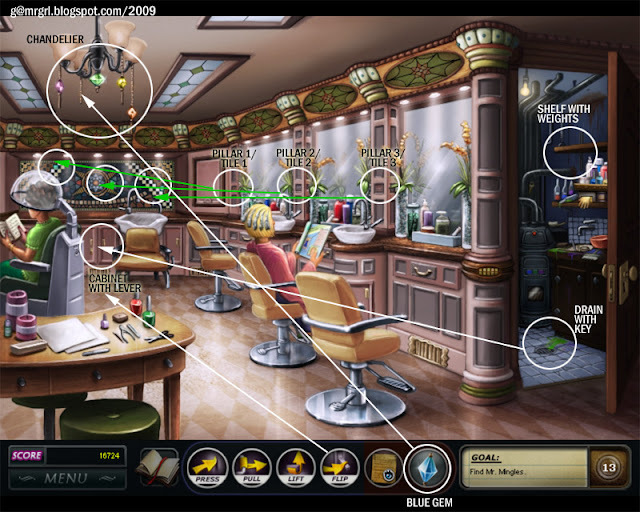 Click the tweezer, on the left of the scissors, on the table at bottom left. Click the pipes. The screw is removed. Click the pipes again. They have to be stuck together. Click the small blue bottle of nail glue, on the extreme left on the table with the tweezers. Click the protruding screw above the yellow pipes. Click the nail file on the table, to the bottom left of the tweezers. Now the vacuum cleaner is fixed and shut. Press the red button of the vacuum cleaner. New Goal: Where could the ticking be? Click on Zen Zone in the map. Click for facial 1 / facial 2 / facial 3 / facial 4. New Goal: Get that bomb! The bomb is in the central panel of the many-drawered desk. Nancy needs to open the central panel. Solution: Nancy has to collect 5 knobs across the room to match the 5 empty slots on the desk. Each knob has a raised design and its empty slot has matching holes. Click a knob and then its corresponding hole to make a match. Click the green bomb inside the panel. Solution: Click here for the solution. Click on the note inside the desk panel. It’s from Jasmine to Cassidy. New Goal: Where are Jasmine and Cassidy meeting? Click the garden on the map. The answer to Nick’s question (about Nancy’s whereabouts) is ‘eavesdropping on someone in the garden’. New Goal: Look for clues. Click the brown word puzzle board on the floor in the middle of the room. It says that there’s another bomb in the room. Nancy needs to find 5 alphabet pegs to complete the puzzle. 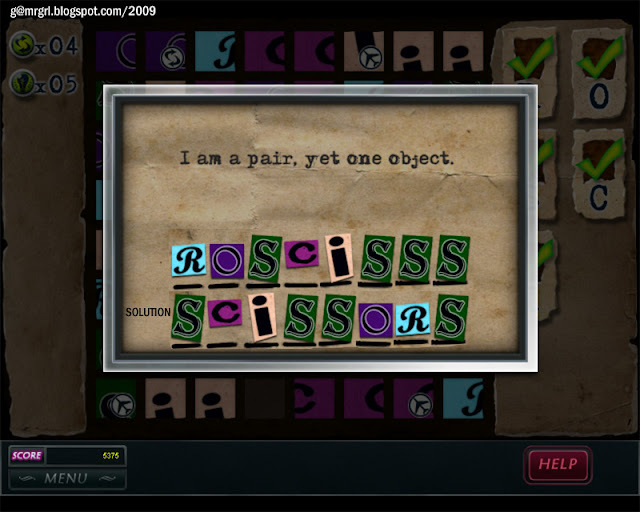 Click here for the locations of ALL items required to solve the word puzzle. Click the left drawer below the shelves with cosmetics. Pull it open. Click the bottle of fish food. 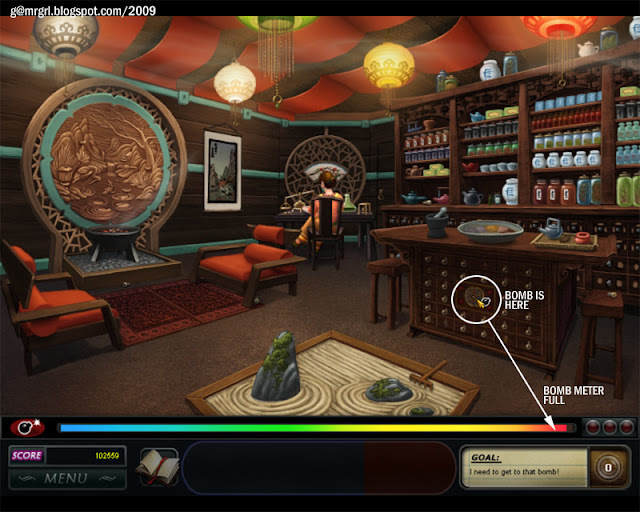 Click the fish bowl on the table beside the red sofa. The fish is happy. Click the fish bowl again. 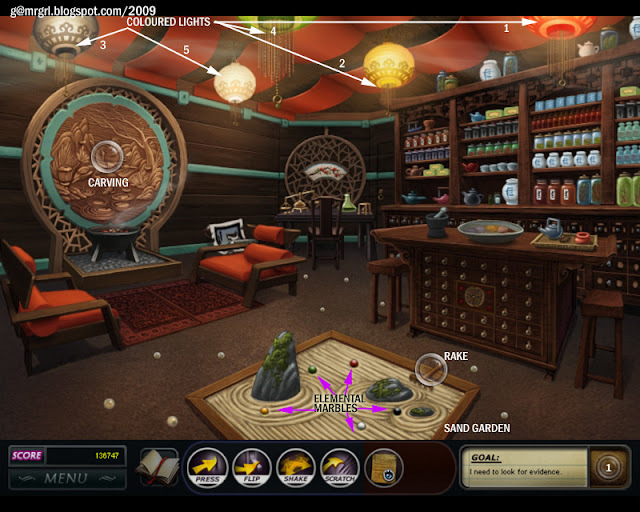 Click the fish net on the table in front of the red sofa. Peg 1 added to the inventory. Click on the peg stuck in the golden curtain hanging from the ceiling in the middle of the room. It’s too high. Click the long decorative branch in the vase on the left of the fountain. Peg 2 added to the inventory. Click the peg stuck in the broken glass of the window to the right of the decorative branch. Click the towels on the reception counter. Peg 3 added to the inventory. Click the peg stuck in the ‘R’ in the wall behind the reception. Click the screwdriver in the pencil holder on the reception counter, to the right of the monitor. Peg 4 added to the inventory. 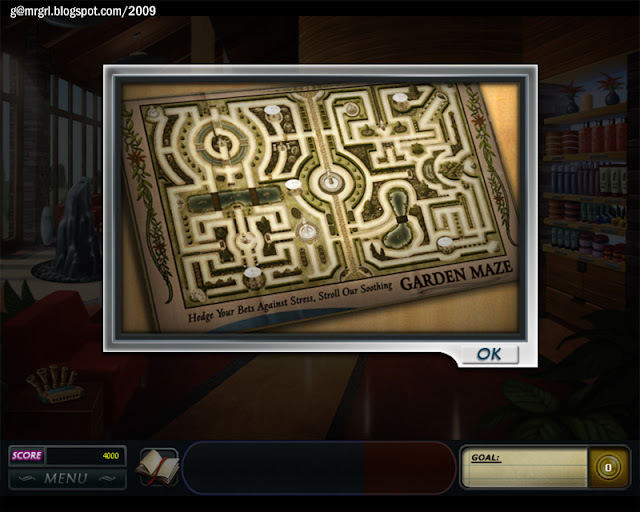 Click the peg stuck in the front of the reception counter, just above the word puzzle board. Click the screwdriver in the pencil holder on the counter. Peg 5 added to the inventory. Click the pegs in the inventory. Click the word puzzle board. 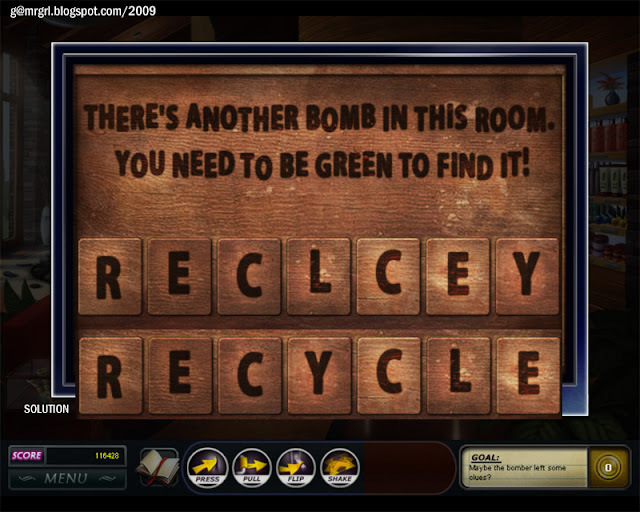 Solution: This is a jumbled word puzzle, with the word RECLCEY and the hint ‘you need to be green to find it’. Click on the alphabets to move them around. The answer is RECYCLE. New Goal: Find the second bomb. The bomb is in the recycle bin, the right-most cabinet of the reception. Click the recycle bin. Pull it open. There’s a warning note for Nancy, and a threat for Nick from Helfdan. 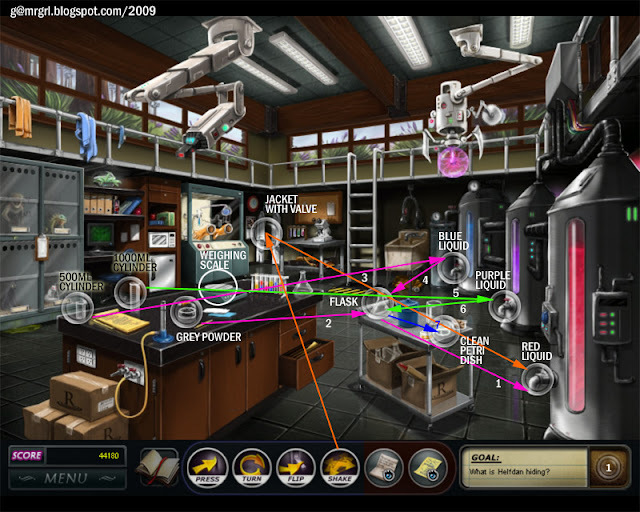 Click the laboratory on the map. 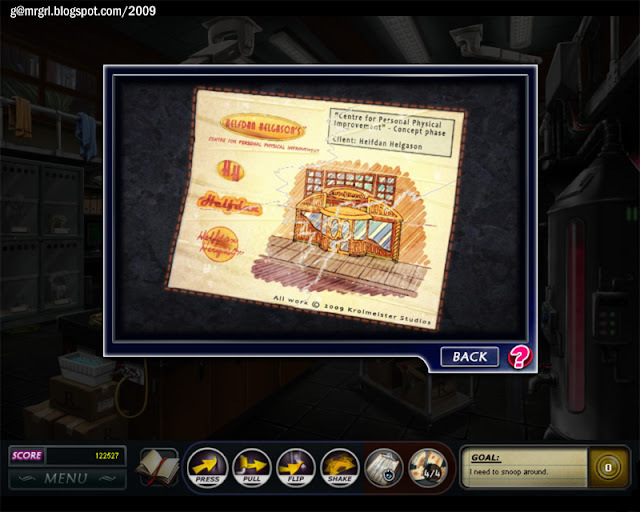 Click the clipboard stuck on the glass animal cage at the extreme left of the screen. It has a list of the 4 animals in the cages, their medical problems, solutions and special treats. The animals have to be cured before they can be fed. 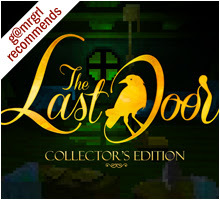 This list is added to the inventory and can (and should) be read carefully to solve the problems. The animals can be treated in any order. Start with Bean the monkey, who has sunburn and needs aloe vera gel (not the leaf), plus Monkey Chow treat. Click Bean in the top left shelf of the monkey cage. There’s a sheet of paper in his cage. Click the aloe vera leaves on the top shelf to the right of the animal cage, above the monitor. Click the rolling pin in the carton on the lower shelf of the trolley in the middle of the room. The aloe vera gel is the green paste on the white tray in front of the coloured test tubes on the desk. Click the gel. Click Bean. The sunburn’s better. Click the bag of Monkey Chow on the lower shelf of the table to the left of the ladder at the back of the room. Click Bean. Click Bean again to take the sheet of paper. Click here to view Bean’s solution. Now to Molly McKenna’s cat. She has itchy skin due to allergies and needs gray paste on affected areas + a special tuna treat. 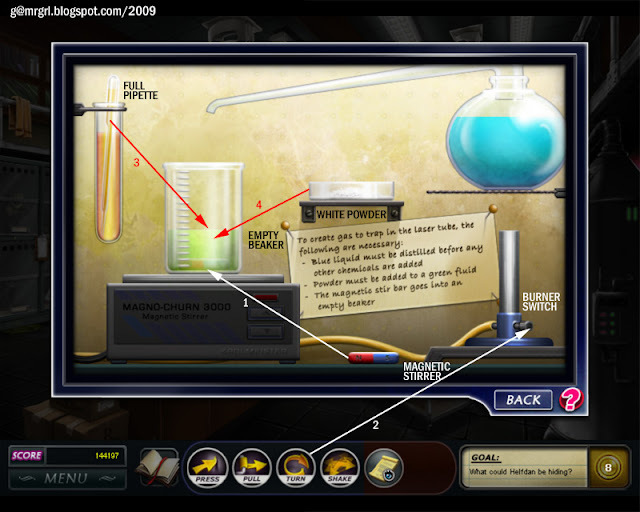 Click the small bowl of gray powder to the right of the Bunsen burner on the desk. Click the empty conical flask on the top shelf of the trolley. Click the flask with gray powder. 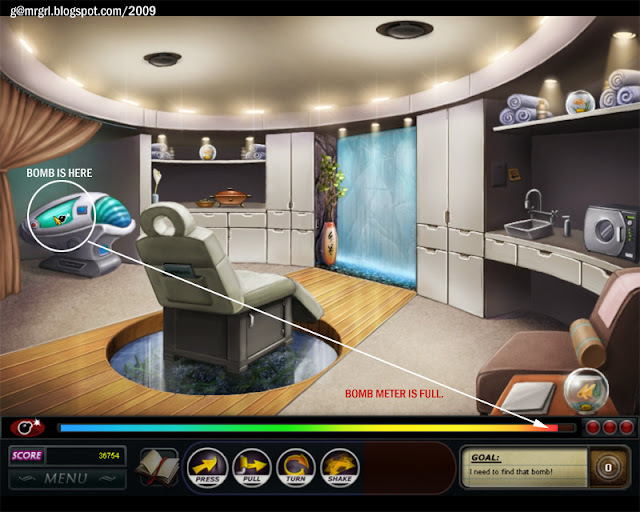 Click the sink at the back of the room, to the right of the ladder. Click the flask with the gray paste. Click the cat in the bottom left shelf of the animal cage. Click the refrigerator in the middle of the left shelves, below the microwave. Pull it open. Click the open can of tuna. Click the cat. Click the cat again to take the sheet of paper. Click here to view the cat’s solution. Iggy the iguana has indigestion from eating too many loquats, and needs indigest-away tea (heated and then cooled), and a loquat as a special treat. Click the jar with tea (teabag) on the trolley, beside the blue jar. Click the hot jar of tea. Click the ice tray sitting on the cartons in front of the desk. Click the cooled jar of tea. Click Iggy. Click the labcoat hanging at the rear left corner of the room. Shake it. Click the loquat. Click Iggy. Click Iggy again to take the sheet of paper. Click here to view Iggy’s solution. Casper the rat has light sensitivity and needs his special sunglasses being made elsewhere, and nuts. Click Casper. He’s fine, no need for sunglasses. Click the petri dish with nuts on the right of the top shelf of the trolley. Click Casper again to take the sheet of paper. Click here to view Casper’s solution. Solution: Click the 4 pieces of paper in the inventory, recovered from the animal cages. This is a simple jigsaw as there are only 4 pieces. Click the pieces to move them around and place them correctly. Click the office on the map (it’s in the smaller building). New Goal: Reverse the flow. Mr. Mingles is in trouble again! Click here for the locations of ALL items required to flatten the CAEMBADS. Click the yellow note taped to the open drawer on the right. It says ‘controls are in the floor’. Click the handle on the CAEMBADS chair’s side. The chair needs to be flat for panel to open. 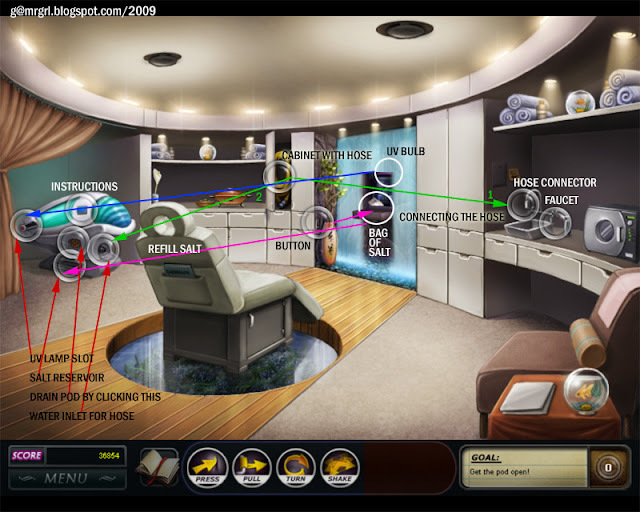 Click the CAEMBADS control panel on the wall above the sink. Nancy needs a long, sharp item to open it. Click the microwave to the right of the sink. Pull it open. Click the sharp probe tool. Click the control panel. The panel is open – it has a red button. Press the red button. The chair is flat. Click the handle on the side of the chair. Pull it. Click the green button. Press it. Whoa! Click here for the locations of ALL items required to operate the CAEMBADS. Click the Login screen on the CAEMBADS monitor. It needs a three-word password. Click the fishbowl (3) on the orange table at the bottom right of the screen: it says ‘BAIT’. Putting the three together, we get SH ARK BAIT i.e. SHARKBAIT. Click the Login screen, then fishbowl (1). Click the Login screen, then fishbowl (2). Click the Login screen, then fishbowl (3). There are two arm joints and both are stuck. Click arm joint 1 – the blinking green light, behind the big orange lamp. Click the bottle of oil / greasy lotion on the top shelf of the right side cabinet, beside the towels. Click arm joint 2 – the green light at the top of the CAEMBADS’ arm. Click the bottle of oil / greasy lotion. 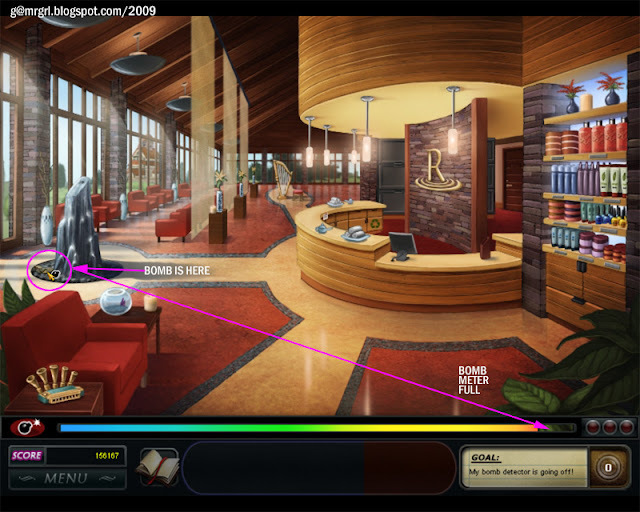 Click the laser button at the left bottom of the ‘Imaging Laser’ screen. Press it. Click the laser button at the right bottom of the ‘Imaging Laser’ screen. Press it. The laser cuts a panel in the floor. Nancy needs a tool to pry the panel. Click the flat tool in the microwave. Click the floor panel. Click the broken red lever. Click the surgical glue on the flat tray on the right of the chair. Click the fixed lever. Pull it. New Goal: Snoop in Mrs. Montague’s purse. Click the paper poking out of Mrs. Montague’s purse. Click the note on the desk. It says, ‘a little something for the ladies’. Solution: This is another note game, to be played as usual. But now we have tiles with a ‘foot’ icon, which can be swapped with an adjacent tile without having to make a match, and tiles with a ‘starburst’ icon, clicking which gives the ‘Clean Slate’ power-up, which can be used to blast ALL bombs and locks on the screen. Definitely helpful additions. Solution: Unscramble the word. 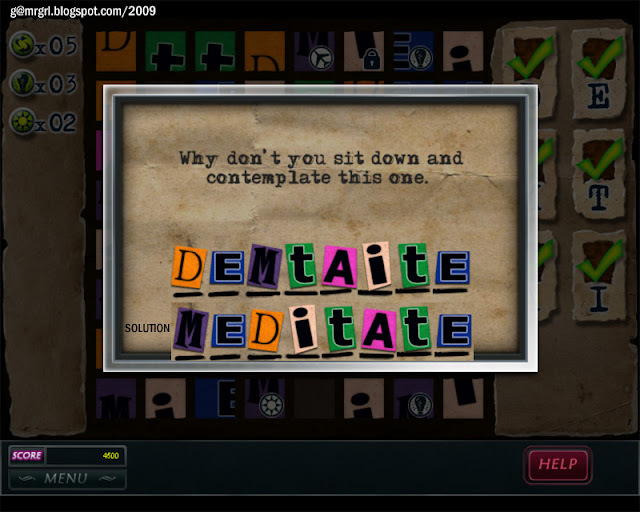 Hint: ‘Why don’t you sit down and contemplate this one?’ Unscramble ‘DEMTAITE’ to get ‘MEDITATE’. Click the Zen Zone in the map. Chapter 24: Stop The Bomb. New Goal: Stop the bomb. Another bomb in this room! The bomb is in the leftmost jar on the top shelf of the cabinet. Solution: Yet another twist! Some pieces of pipe are now fixed – they cannot be moved, but they can be used to connect to other movable pieces. But 1:20 was a good amount of time to solve this one. New Goal: Look for evidence. Find 3 items in 3 categories that match each of the 5 carved elements. To find them, dig in the ground and touch(red) colours(yellow) in(black) the(green) sky(white). Click here for the locations of ALL items required to start the carving puzzle. Click the sand garden in the middle of the room. Click the rake beside it. Many additional marbles fall from the lamps. Click the sand garden to collect all the marbles. Click the huge round carving on the left wall. Click the note exposed by the sand garden. New Goal: Read the evidence. Another run around the maze, this time on the trail of – yes, Mr. Mingles. Use the cursors (easier) or the left mouse key to move Nancy. Mr. Mingles' location is indicated by the red arrow. Nancy needs to come close to Mr. Mingles when he is standing, indicated by a white circle around him. There’s no use getting close to him when he’s moving. When Nancy come within the white circle, Mr. Mingles will bury a scrap of paper. Nancy has to dig it up (walk over the dirt pile). A total of 5 collections are required. Solution: This is a jigsaw. Drag and drop paper fragments into the square to reconstruct the letter. The pieces snap to correct places. Start with the corners, then the edge pieces, and finally the middle pieces. Click here for the locations of ALL items required to discover what Helfdan is up to. Click the yellow notepad on Helfdan’s desk. It is added to the inventory. Click the notepad to read it. Helfdan’s Follicle Stimulating Laser (FSL) has to be tested by targeting a glass ball containing a metal key. But before that, the gas for the laser must be placed in a vacuum tube. Then the vacuum tube is inserted into the laser. And before all this, the poisonous gas has to be created in the corner biohazard case. Click the biohazard case on the right of the refrigerator. Click the red/blue stir bar on the table. Click the empty beaker. The stir bar is now in the beaker. Click the switch at the base of the Bunsen burner. Turn it. The blue liquid distils into the beaker. Click the pipette in the yellow test tube on the left. Click the beaker. Now the solution is green (blue + yellow). Click the powder in the petri dish in the middle of the screen. Click the beaker. The gas is ready. Click the labcoat to the right of the biohazard case. Shake it. Click the laser tube container. Click the gas nozzle on the left panel of the biohazard case. The gas-filled laser tube is placed on Halfdan’s desk. Click the clipboard hanging on the animal cage at the left of the screen. Click the clipboard in the inventory. It’s the same sheet Nancy had for taking care of the animals. Click the monitor on the right of the animal cage. Solution: Nancy has to answer 6 multiple choice questions. The answers are on the animal care sheet. The laser is initiated and needs the tube of gas. Click the red button on the laser, above Helfdan’s desk. Press it. Click the open compartment on the laser. Click the laser tube. Click the key on the floor. 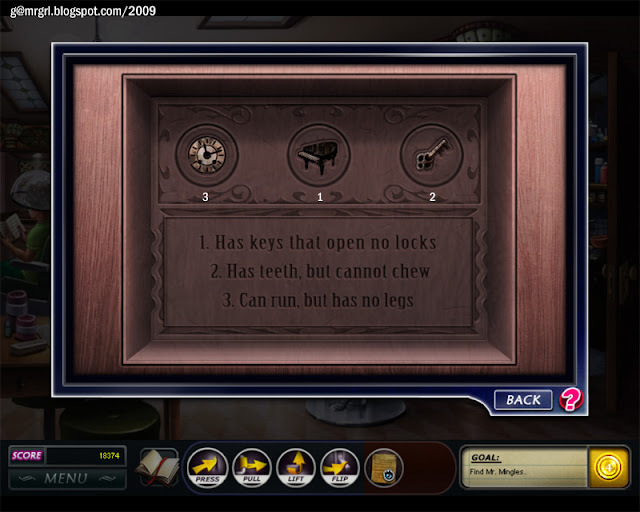 Click the locked cabinet – the middle vertical door – of Helfdan’s desk. Click the letter on the bottom shelf. Solution: This is another note game, to be played as usual. A twist now – a BOMB tile with a counter. Every time a match is made that does not include the bomb tile, the bomb counts down by one. And when it reaches zero, it changes all nearby tiles into locks! 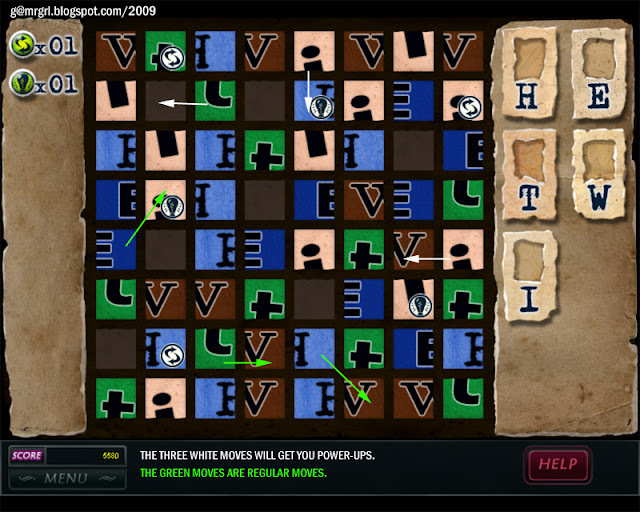 A bomb tile has to be matched with another tile to remove it from the board. This does complicate matters, and the ‘Sunburst’ i.e. eliminator power-up that unlocks locked tiles is really valuable here. 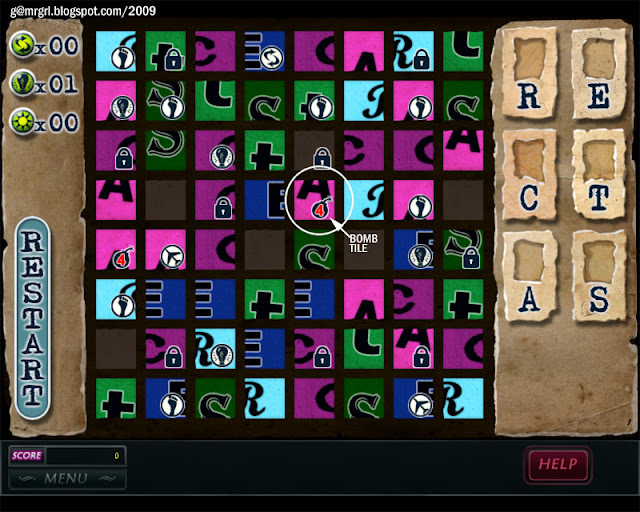 Click here to view the sample puzzle screen. Solution: Unscramble the word. 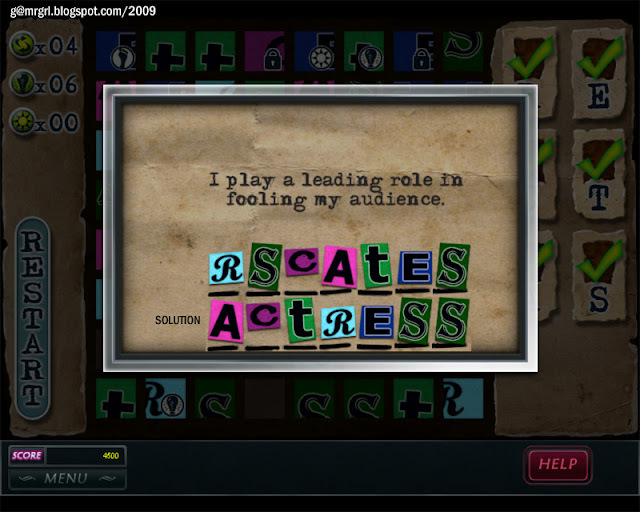 Hint: ‘I play a leading role in fooling my audience.’ Unscramble ‘RSCATES’ to get ‘ACTRESS’. New Goal: The word is ‘actress’. Click the Guest Suite in the map. Click the lamp shade on the left of the bed headrest. The bomb is here. 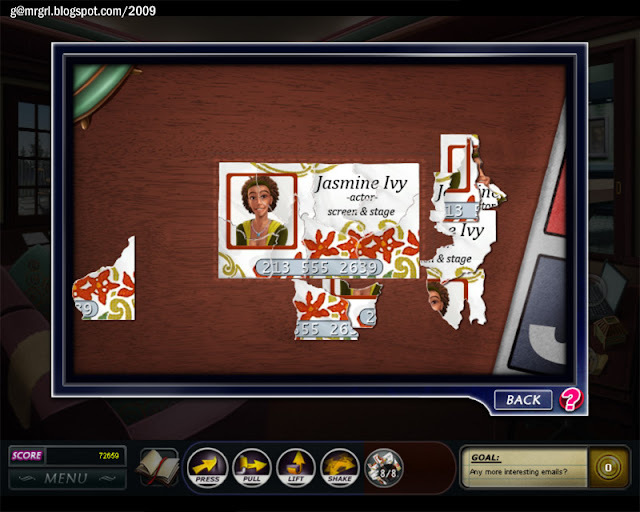 Click here for the locations of ALL items required to discover the evidence in Jasmine’s room. Click the pagoda box (1) on Jasmine’s desk, beside the laptop. Click the hanging crystal leaf (1) from the right-side balcony door. Half a key (1) is revealed. Click the round box (2) on the coffee table in front of the sofa. Click the hanging crystal leaf (2) on the door of the shower enclosure. The other half of the key (2) is revealed. Click key 1. Click key 2. A new golden key is formed. It says: ‘A secret I keep’. Click the middle cabinet door in the bathroom. Pull it open. Click the manual. It has instructions about Yorick the octopus. The sliding panel on the left of the aquarium is used to control maintenance and feeding. Nancy has to distract Yorick with a puzzle such as opening a food container to take the key from him. Click the sliding panel beside the aquarium. Pull it. 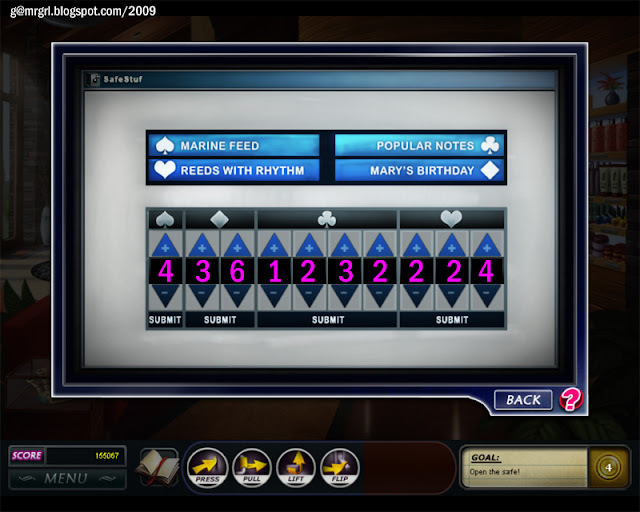 Click the control panel of the aquarium. Press the green button. The centre panel at the top of Yorick’s tank is now open. Click the refrigerator – the left cabinet door in the pantry. Pull it. It has a tin of crab. Click the Koko Kow container on the desk, beside the laptop. It contains candy. Click the empty bowl on the pantry counter, on the left of the suitcase. Click the empty Koko Kow container. Click the tin of crab. Yorick’s food puzzle is ready and in the inventory. Click Koko Kow with crab. Click the aquarium. Click the centre panel of the aquarium to take the key from Yorick. Click the black key in the inventory. Click Jasmine’s suitcase. Click the diary. Click the golden key in the inventory. New Goal: Find Mr. Mingles. 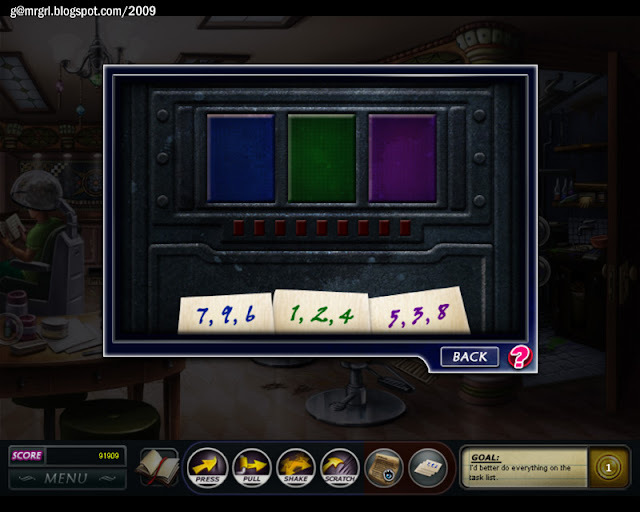 Click the lowest door of the black locker cabinet behind the reception counter. Lift it. There’s a safe inside. Nancy has to open the safe to get Mr. Mingles out. Click the safe. The blue sticky says safestuf.exe. New Goal: Open the safe. Click the monitor on the reception desk. On the top right of the screen is the program safestuf.exe. 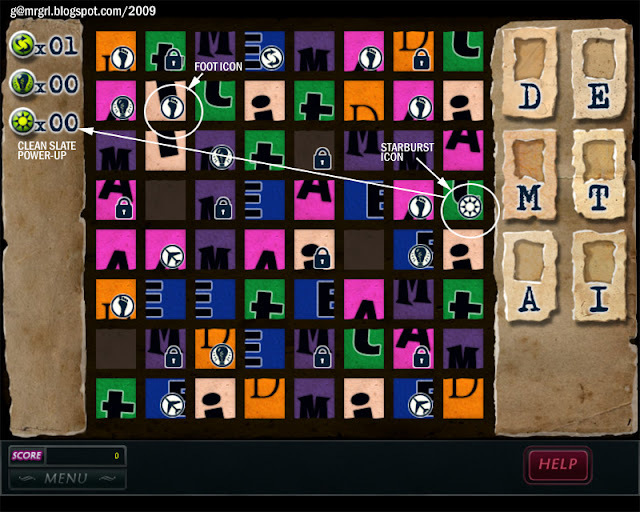 Click here for the locations of ALL items required to decode the puzzle. Click the calendar on the reception counter, beside the pencil holder, left of the cosmetics shelf. Mary’s birthday is marked as 6th March. Since this game is American, that’s 3/6, not 6/3. 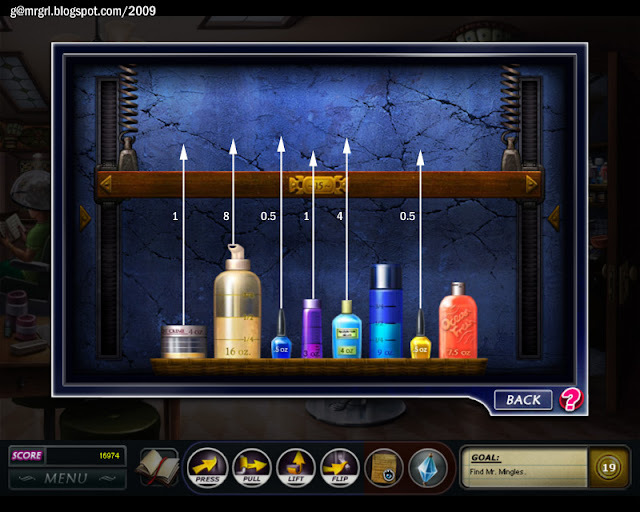 Click the top left cabinet of the cosmetics shelf. Pull it. Click the jar of fish-food (marine feed) inside. It says, ‘FORtify Your Fish’. So that’s 4. Click the red stool beside the harp at the back of the room. Lift it. Click the sheet music inside. It is for a popular song (note), and says, ‘1, 2, 3 To A Better Me’, so the numbers are 1, 2, 3, 2. 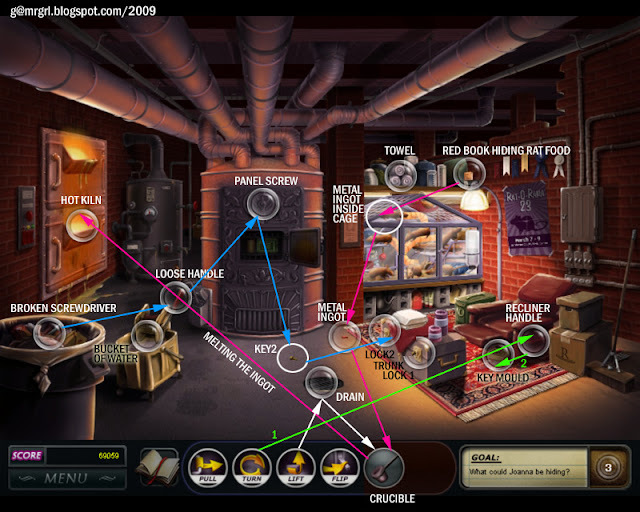 Click the harmonica case in front of the red sofa, at the bottom left of the screen. Lift it. Click the harmonica (reeds with rhyme). It says, ‘Too cool to play forever’. So the numbers are 2, 2, 4. The answer to Nancy’s comment (botched) is ‘spinal manipulation’. The answer to Nancy’s question (about Helfdan) is ‘has been talking to Mrs. Montague about funding’. The answer to Nancy’s question (about staff members) is ‘date guests’. The answer to Nancy’s comment (about what Jasmine did) is ‘her brother’. The bomb is in the stony rubble at the foot of the fountain near the reception door. Click the rubble. There’s no bomb, but... the mad bomber’s map! New Goal: What is this? Click the pig in the bottom left corner of the screen. It says, ‘He wrote about Charybdis’s whirlpool’. Nancy has to go where there are lots of statues. New Goal: Solve the garden puzzle. This is a really elaborate puzzle involving the various Greek statues placed around the garden. Walk Nancy around using the cursors and click on various statues to check who they are. Nancy has to stand right next to a statue to be able to click it. At any time, Nancy will have an item in the inventory, beside the coins. The clue about the next statue can be found by clicking the item. She has to use the clue to find the right statue, then click the item in the inventory to ‘give it’ to the statue. In turn, she will get another item, another clue and a coin. All 12 coins have to be collected to open the door of the bomb shelter. Click here for a map of the garden showing ALL statues and their items. Nancy has a pig and the clue ‘He wrote about Charybdis’s whirlpool’. Click the statue of Homer just behind Nancy when she starts in the central circle, with the three ‘whirlpools’ in the fountain. Click the pig. 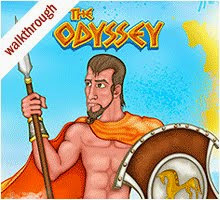 Homer’s caption: ‘Bow sternly on an epic journey’, talks about the Odyssey. A scroll (clue: the teacher is influential) and coin is received. Click the statue of Pythagoras at the extreme bottom left of the map, teaching a group of students. Click the scroll. Pythagoras’ caption: ‘His theory is a trinity of points’, refers to his theorem about the hypotenuse of a triangle. A lyre (clue: the first one was made of shell) and coin is received. Click the statue of Hermes, directly north of Pythagoras. Hermes built the lyre from tortoise shell (hence the tortoises at his feet, though eventually, Apollo was given the lyre, and HE usually carries it, being the god of music). Click the lyre. Hermes’ caption: ‘Flighted messenger’, refers to him being the messenger of Zeus / Greek gods. 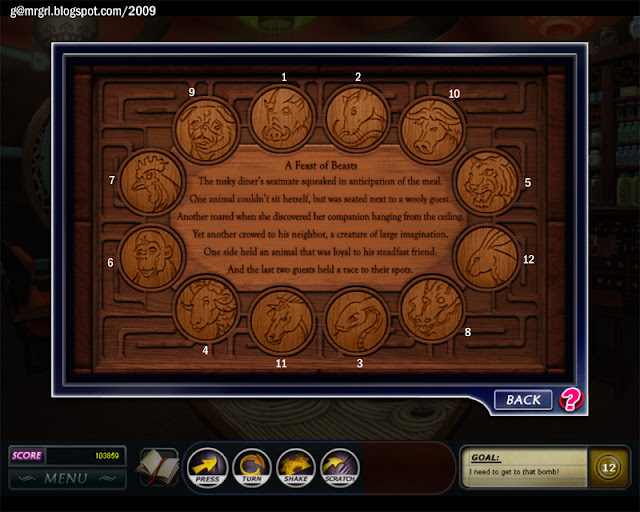 A snake (clue: chasing after the laurel tree) and coin is received. Click the statue of Apollo at the extreme top right corner of the maze. Apollo killed Python, a snake, and also wears a crown of laurel, reminiscent of his botched (by Zeus) love affair with Daphne, a nymph. Click the snake. Apollo’s caption: ‘Opposite to Artemis and Poseidon’, refers to his twin sister, Artemis, though I’m not sure about the relation with Poseidon. A trident (clue: play among the waves) and coin is received. Click the statue of Poseidon to the southwest of Homer, surrounded by dolphins. The trident was Poseidon’s weapon of choice, plus the ‘waves’ refer to him being the god of the sea. Click the trident. Poseidon’s caption: ‘School’s master’, refers to schools of fish. An axe (clue: creates things of metal) and coin is received. Click the statue of Hephaestus at the extreme middle east of the garden. Hephaestus is the Greek god of metal, and sometimes carried an axe, though his main items are hammer, anvil and tongs, tools of his trade. Click the axe. Hephaestus’ caption: ‘Lights the night with his fire’, refers to his forge. Scales (clue: a burning desire for knowledge) and coin is received. Click the statue of Hippocrates at the north-west of Homer. Hippocrates was a Greek physician and is known as the ‘father of modern medicine’. The scales represent ‘balance’ as he held that illnesses were caused by imbalances in the body and his cure involved restoring that balance. Click the scales. Hephaestus’ caption: ‘Repeats his oath’, refers to the Hippocratic Oath taken by new doctors to follow ethical medical practices. A bunch of grapes (clue: he spoke of animals and morals) and coin is received. Click the statue of Aesop at the extreme bottom right of the map, since Aesop’s fables largely used animals to narrate stories with morals. Click the grapes. Aesop’s caption: ‘Slow and steady wins the race’, refers to his famous fables about the hare and the tortoise. A feather (clue: she is a pillar of wisdom) and coin is received. Click the statue of Athena to the immediate north-west of Homer. Athena is the Greek goddess of wisdom, and is sometimes being shown with wings. Click the feather. Athena’s caption: ‘winged and wise’. A dog (clue: nurturing huntress) and coin is received. Click the statue of Artemis to the immediate north-west of Athena. Artemis is the Greek goddess of the hunt, and is often accompanied by a hunting dog, and is shown with a moon on her head. Click the dog. Athena’s caption: ‘hunts only by moonlight’. A tool (?) (clue: waiting for an eclipse) and coin is received. Click the statue of Hipparchus to the north-east of Homer. He was a Greek astronomer, hence the ‘eclipse’ reference. Click the tool. Hipparchus’ caption: ‘Never looked down’, refers to his stargazing. A compass (clue: Alexandria’s library mathematician) and coin is received. Click the statue of Euclid at the south-west of the map, to the left of Poseidon. Euclid was a Greek mathematician, known as the ‘father of geometry’. Click the compass. Euclid’s caption: ‘His axioms were obtuse and acute’, refers to geometric angles. New Goal: Open the door. Solution: There are two wheels with 5 slots each where the 10 coins from the garden maze have to fit. There are two pictorial clues at the base of the wheels that indicate which coin goes where. The pictures link back to the captions (earlier in the walkthrough) on the plaques of the various statues. Click and hold a coin to lift it and drag it to a particular slot. 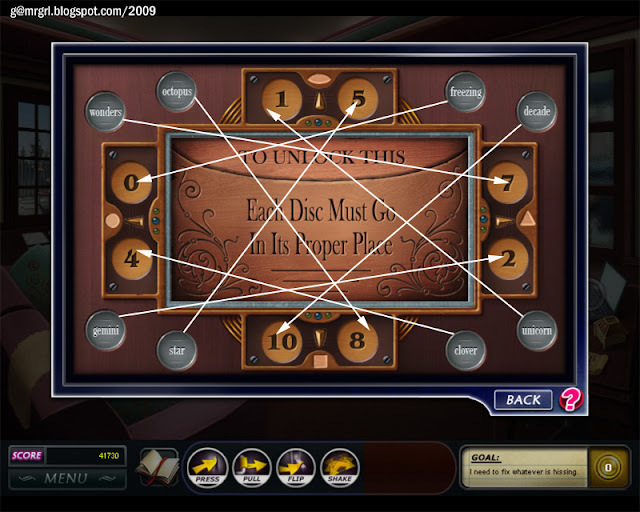 Then turn the wheel to get the next clue. My answers are turning the wheel clockwise. Nancy has to turn on the light. Click here for the locations of ALL items required to turn on the light. Click the severed cord on the floor in the middle of the screen. 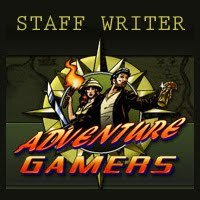 Click the severed cord hanging from the left side table, beside the blue sleeping bag at the right of the screen. Click the joint of the two severed cords. Click the soldering iron – the orange gun on the left edge of the table. Click the sticky notes hanging from the top shelf – they’re blank! Click here for the locations of ALL items required to discover the evidence. Click the crank beside the fan on the back wall. Turn it. The phonograph needle is inside. Nancy needs something long and sticky to get it out. Click the spool of red wire on the left side table. Click the wire cutters on the left side table, beside the soldering iron. Click the piece of red wire on the left side table. Click the cellotape on the right side table. Click the red wire + cellotape on the left side table. Click the phonograph needle. Click the needle in the inventory. Click the phonograph. The phonograph is now ready. Click it. Turn the crank. Click the open cabinet at the back of the room. Click the black bulb. Click the fluorescent bulb of the lamp on the left side table. Now Nancy can read the sticky notes. Click the sticky notes. Once upon a / time a specialty, / luxury spa was built / in Northern California. / Its clients were / wealthy and beautiful / but they and the spa / were rotting from inside. Click the locked suitcase on the top shelf, above the right side table. Click the open suitcase. A blank journal? Click the journal. Click the lamp on the left side table. The answer to Nancy’s comment (about Mrs. Montague’s fortune) is ‘selling digital components’. Solution: The big kahuna! The last, but not the least! Though this had ample time – 1:30 - and I got it the first time! I was really disappointed to not get the Ultimate Private Eye score, probably because I took too long to solve some of the puzzles as I was writing the walkthrough and all that back-and-forth takes away from game-play *sigh* On the bright side, Her Interactive says there are 6 different endings, and that gives me a reason to play this game again sometime in the future, so there’s another chance at getting full marks!